The Development Assessment Panel will make determinations on the basis of established criteria and practice and will not be influenced by "lobbying" and "weight of numbers" in its assessment process. 4. To provide a forum for objectors and applicants to make submissions on applications before DAP. 5. To maintain transparency for the determination of development applications. 2. Determine development applications under Part 4 of the Environmental Planning and Assessment Act 1979 having regard to the relevant environmental planning instruments, development control plans and Council policies. 3. Vary Modify or release restrictions as to use and/or covenants created by Section 88B instruments under the Conveyancing Act 1919 in relation to development applications for subdivisions being considered by the panel. 4. 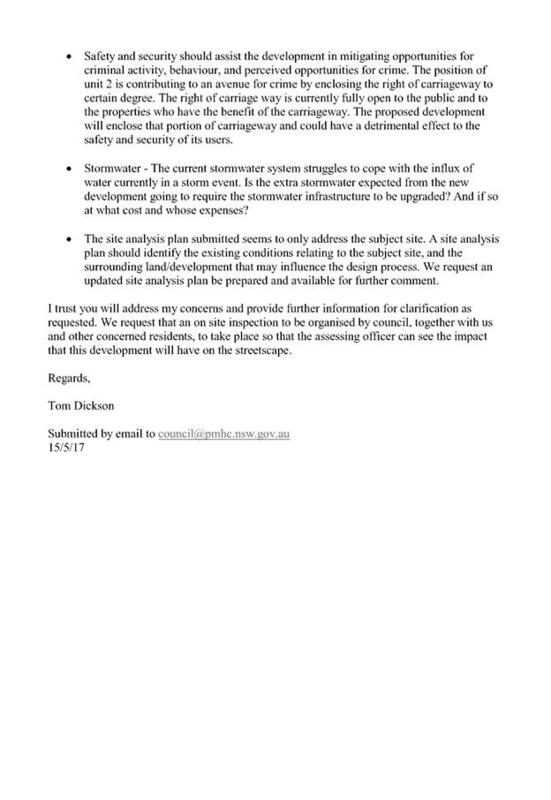 Determine Koala Plans of Management under State Environmental Planning Policy 44 - Koala Habitat Protection associated with development applications being considered by the Panel. The Development Assessment Panel shall generally meet on the 1st and 3rd Wednesday each month at 2.00pm. The venue will be determined according to the likely number of participants. 1. The Business Paper for the meeting shall be published and distributed on the Friday prior to the meeting. 2. Special Meetings of the Panel may be convened by the Director Development & Environment Services with three (3) days notice. 3. The format of the preparation and publishing of the Business Paper and Minutes of the Development Assessment Panel meetings shall be similar to the format for Ordinary Council Meetings, except that the movers and seconders shall not be recorded and only the actual decisions are shown. Minutes shall also record how each member votes for each item before the Panel. 1. Panel meetings shall be carried out in accordance with Council's Code of Meeting Practice for Council Sub-Committees, except where varied by this Charter. 2. Meetings shall be "Open" to the public. 3. The Panel will hear from applicants and objectors or their representatives. Where considered necessary, the Panel will conduct site inspections which will be open to the public. The Chair of the Development Assessment Panel shall be an independent person appointed by the General Manager. The Independent Chair shall have experience and qualifications relevant to planning. The term of the Independent Chair shall be four (4) years. All members must be present at the Meeting to form a Quorum. Decisions are to be made by the Development Assessment Panel by "consensus". Where "consensus" is not possible, the matter is to be referred to Council. 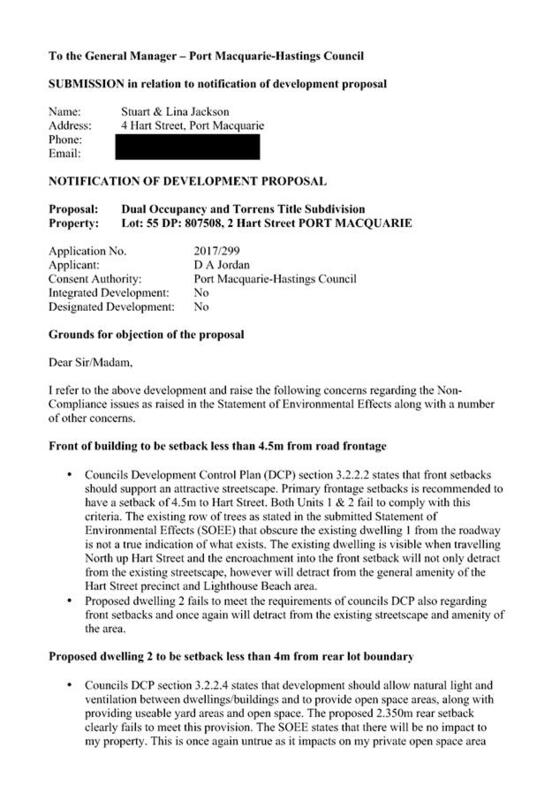 All development applications involving a variation to a development standard greater than 10% under Clause 4.6 of the Port Macquarie-Hastings Local Environmental Plan 2011 will be considered by the Panel and recommendation made to the Council for determination. Staff Members shall not vote on matters before the Panel if they have been the principle author of the development assessment report. 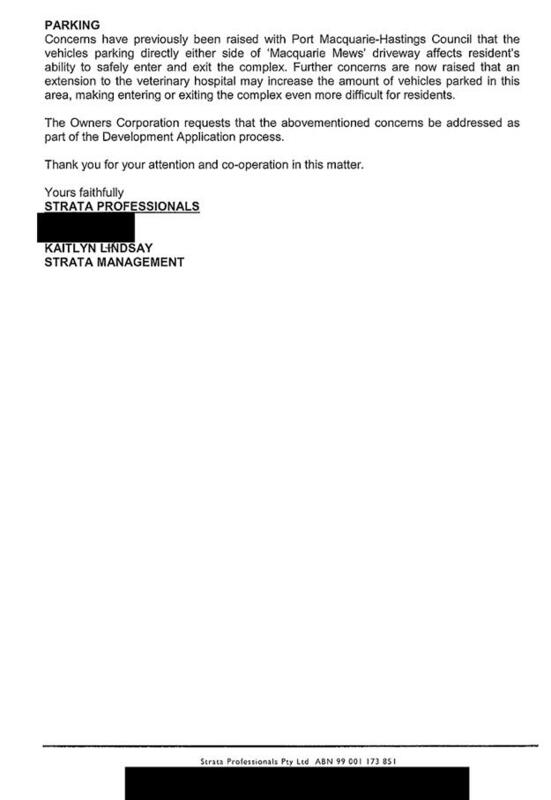 Outside of scheduled Development Assessment Panel meetings, applicants, their representatives, Councillors, Council staff and the general public are not to lobby Panel members via meetings, telephone conversations, correspondence and the like. Adequate opportunity will be provided at Panel inspections or meetings for applicants, their representatives and the general public to make verbal submissions in relation to Business Paper items. 1. Members must perform their Development Assessment Panel obligations faithfully and diligently and in accordance with the DAP Code. 2. DAP members must comply with Council's Code of Conduct. 3. Except as required to properly perform their duties, DAP members must not disclose any confidential information (as advised by Council) obtained in connection with the DAP functions. 4. DAP members will have read and be familiar with the documents and information provided by Council prior to attending a DAP meeting. 6. DAP members shall not speak to the media on any matter before the Panel otherwise than with the express approval of the Director Development & Environment Services. 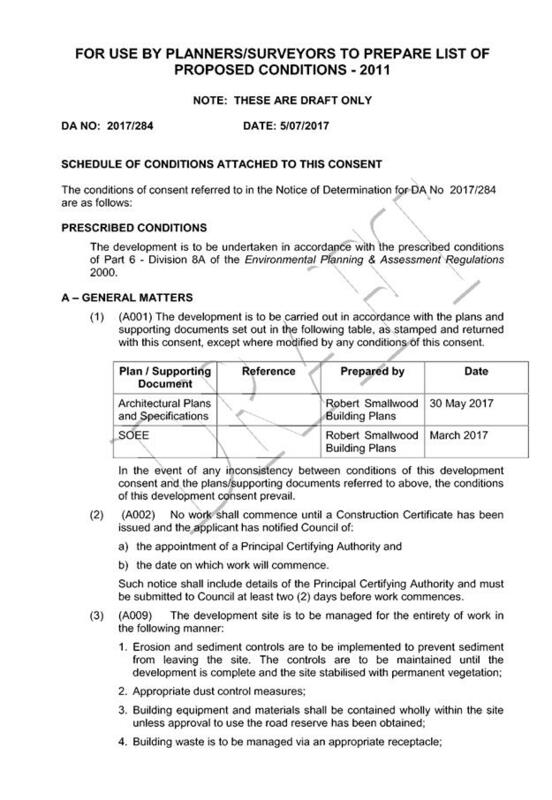 That the Minutes of the Development Assessment Panel Meeting held on 28 June 2017 be confirmed. That the apology received from David Troemel be accepted. 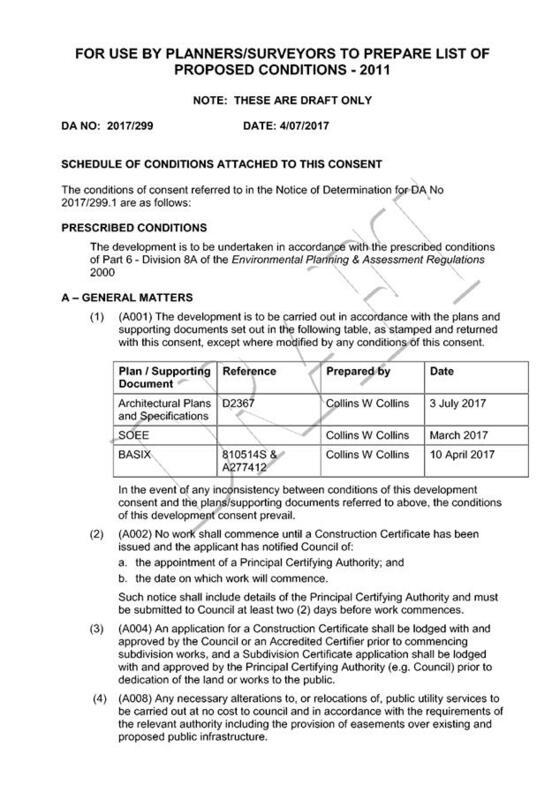 That the Minutes of the Development Assessment Panel Meeting held on 14 June 2017 be confirmed. That DA 2017 - 332.1 for an ancillary building (shed) at Lot 7 DP 1060564, No. 13 Riverbreeze Drive Crosslands, be determined by granting consent subject to the recommended conditions. 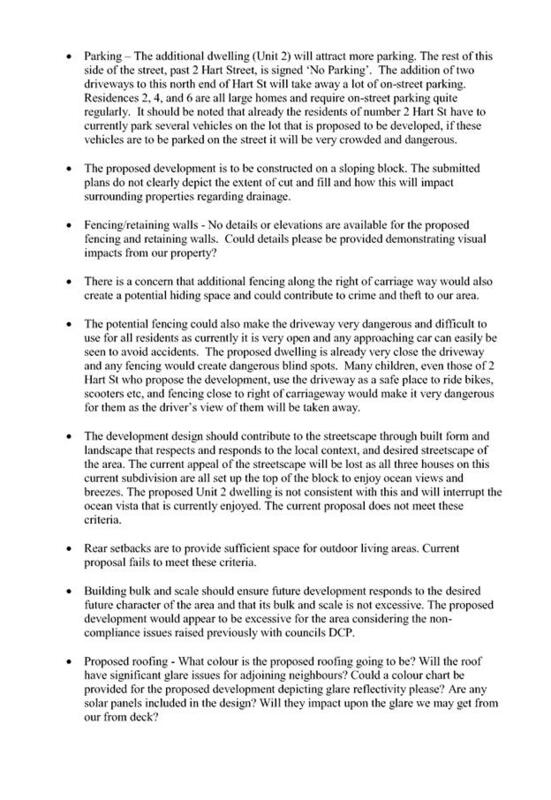 a) The legal point of discharge for the proposed development is defined as the kerb and gutter of a public road. b) The design shall incorporate on-site stormwater detention facilities to limit site stormwater discharge to pre development flow rates for all storm events up to and including the 100 year ARI event. c) An inspection opening or stormwater pit must be installed inside the property, adjacent to the boundary, for all stormwater outlets. The meeting closed at 3:00pm. That DA 2017 - 306.1 for alterations and additions to dwelling at Lot 88, DP260441, No. 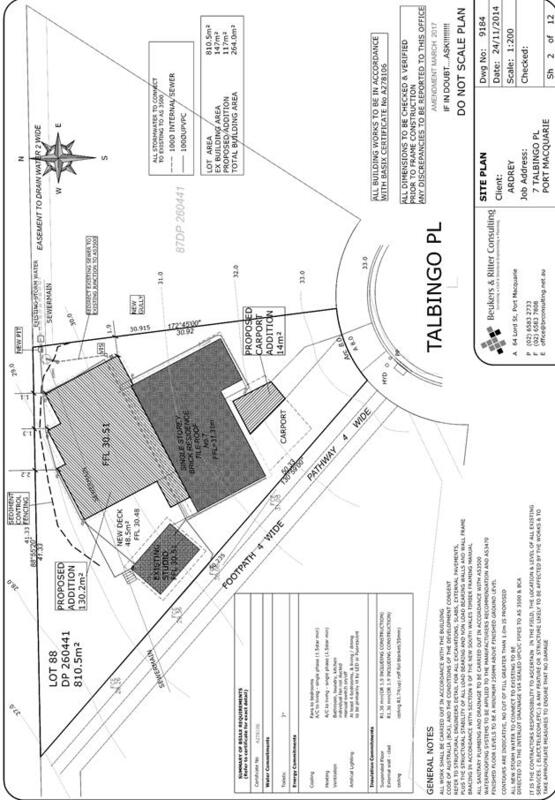 7 Talbingo Place Port Macquarie, be determined by granting consent subject to the recommended conditions. This report considers a development application for a alterations and additions to a dwelling at the subject site and provides an assessment of the application in accordance with the Environmental Planning and Assessment Act 1979. Following exhibition of the application, one (1) submission has been received. The site has an area of 810.5m2. 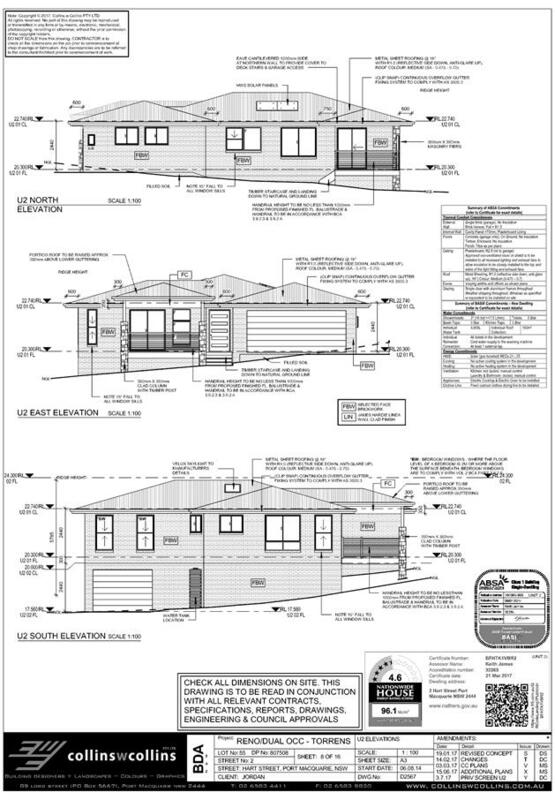 · Additions to dwelling comprising rear dwelling additions, new rear deck and extension of the existing carport. · 12 May 2017- Submission received. The site is not located within a coastal zone as defined in accordance with clause 4 of SEPP 71. A BASIX certificate (number A278106) has been submitted demonstrating that the proposal will comply with the requirements of the SEPP. It is recommended that a condition be imposed to ensure that the commitments are incorporated into the development and certified at Occupation Certificate stage. · Clause 2.2, the subject site is zoned R1 General Residential. In accordance with clause 2.3(1) and the R1 zone landuse table, the dwelling additions are a permissible landuse with consent. · Clause 4.3, the maximum overall height of the building above ground level (existing) is 5.0m which complies with the standard height limit of 8.5m applying to the site. · Clause 4.4, the floor space ratio of the proposal is 0.33:1.0 which complies with the maximum 0.65.0:1 floor space ratio applying to the site.  · Clause 7.13, existing services in place. · Clause 4.6 – exceptions to development standards. · Clause 5.6 – Architectural roof features. 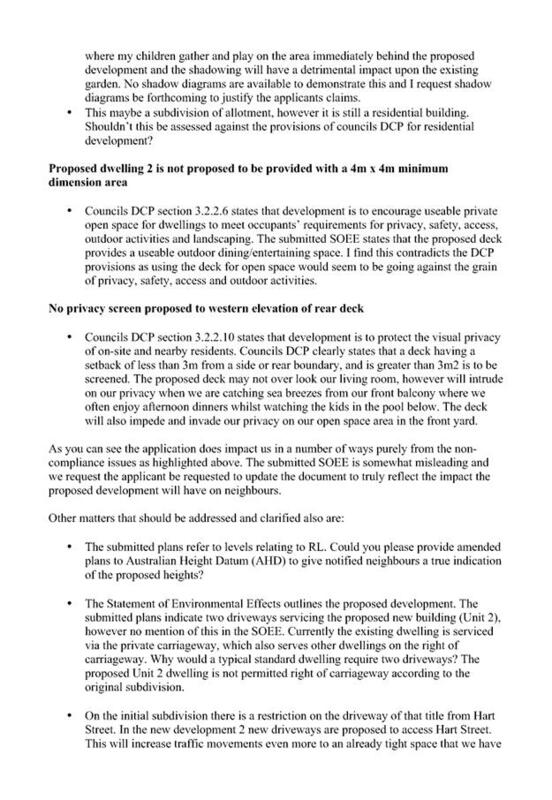 · Clause 5.9 - No listed trees in Development Control Plan 2013 are proposed to be removed. 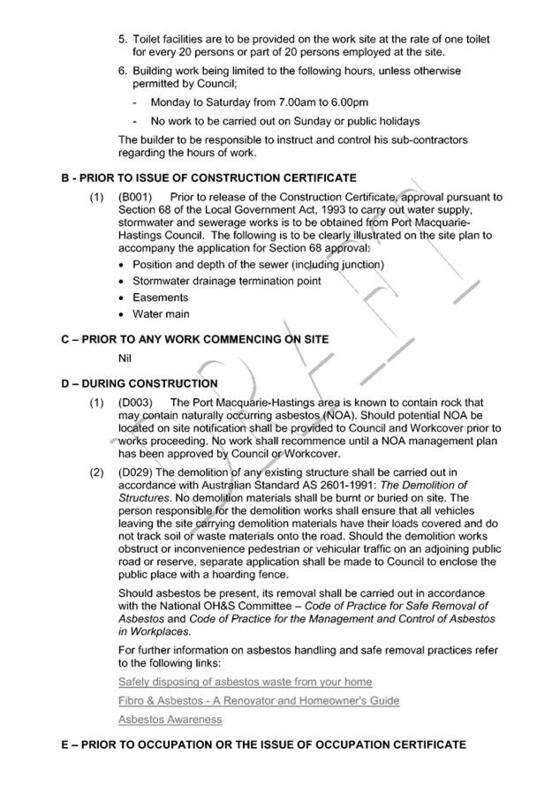 · Clause 7.1, the site is not mapped as potentially containing acid sulphate soils. · Clause 7.3, the site is not land within a mapped “flood planning area”. · Clause 7.5 – Koala Habitat – The land is not identified as a “Koala Habitat area” on the Koala Habitat Map. 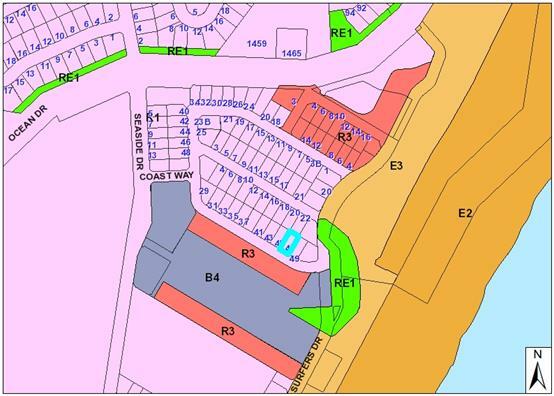 · Clause 7.6 – The land is not identified as a Coastal Erosion Risk on the Coastal Erosion Map (Lake Cathie/Town Beach). 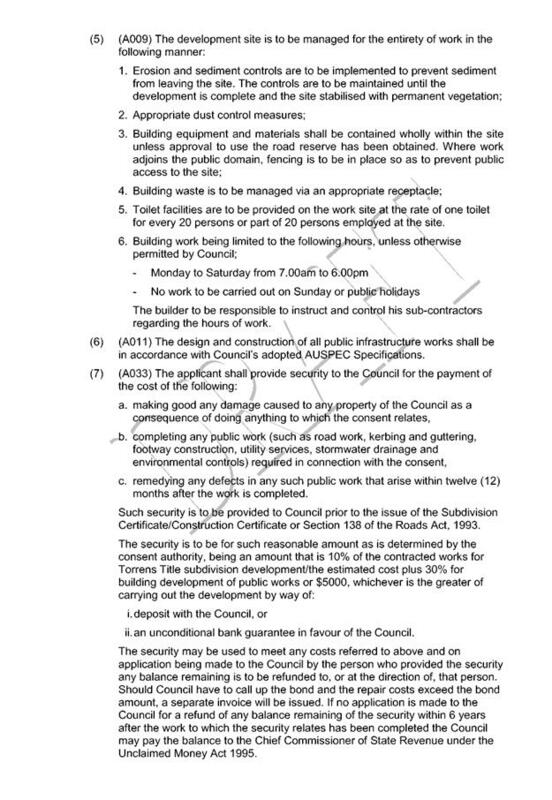 · Clause7.13, satisfactory arrangements are in place for provision of essential services. • First floors & above = min. 3m setback or where it can be demonstrated that overshadowing not adverse = 0.9m min. 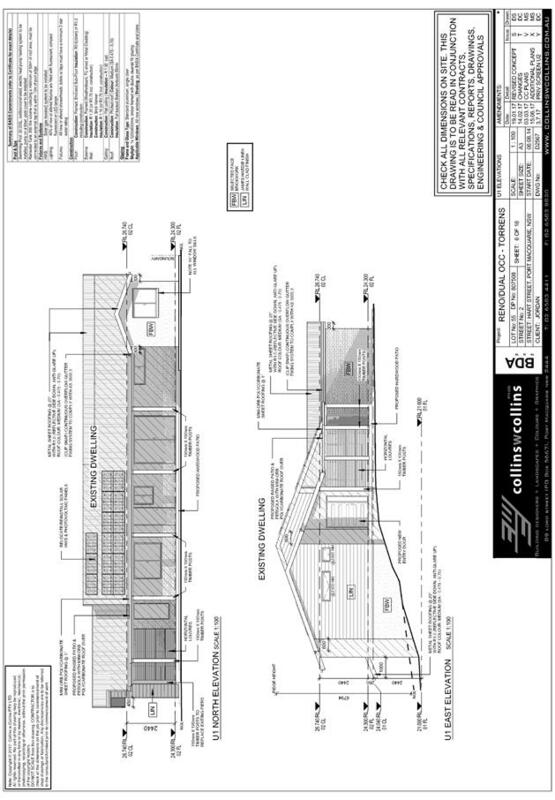 Dwelling additions- 1.9m to 4.6m setback to eastern side boundary. Deck- 4.7m to 6m setback from western boundary. Shadows from the proposed addition will fall predominately on the subject lot with minor overshadowing to the eastern boundary at 3pm with less than 3 hours duration. Adequate separation exists between the adjoining property to the west. Some impact in regard to privacy of open spaces will occur from the proposed rumpus windows. Due to the elevated nature of the site, it is considered that the adjoining properties are already impacted upon by the existing dwelling, & impacts from the proposed additions will comparable to what already exists on site. The upper level rumpus windows are sited less than 3m from the rear boundary for approximately 1/3 of the wall length or equivalent to 1/2 the width of the eastern window. Vegetative screening is provided in part along the rear boundary of the adjoining property. Windows on the upper level north eastern and eastern boundaries are bedrooms & therefore considered a low privacy impact and do not require screening. The rear deck will be sited 4.8m from the rear boundary and 4.7m from the western side boundary & therefore does not require screening. The deck is partially shielded by an existing studio building on the western boundary. Vehicle washing facilities – grassed area etc available. · The variation is considered minor. · The upper level rumpus windows are sited less than 3m from the rear boundary for approximately 1/3 of the wall length or equivalent to half the width of the eastern window. The remainder of the windows are compliant with the DCP provisions. · The provision of a privacy screen to the eastern rumpus window is not considered to be necessary as the second rumpus window is compliant in terms of setback & does not require one. 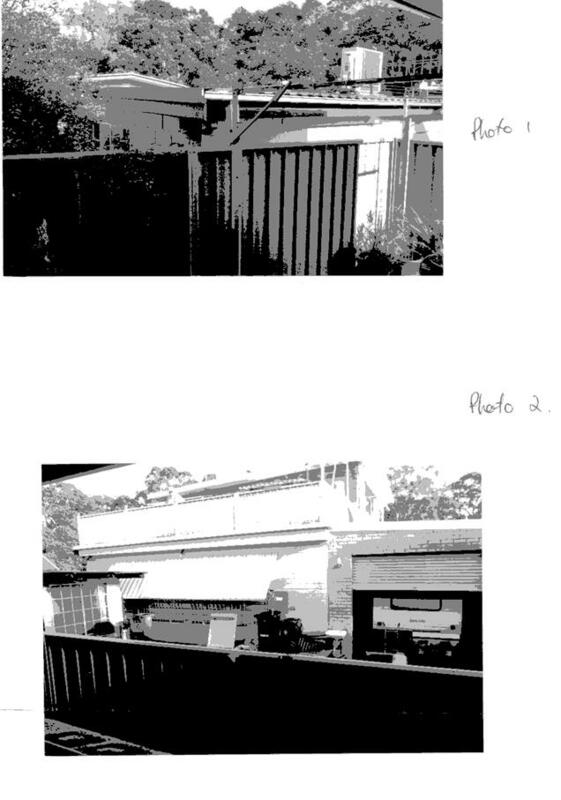 · Existing vegetative screening is provided along a portion of the rear boundary of the adjoining property at the rear. Based on the above assessment, the variation proposed to the provisions of the DCP are considered acceptable and the relevant objectives have been satisfied. Cumulatively, the variation does not amount to an adverse impact or a significance that would justify refusal of the application. The proposed development is consistent with the objectives and strategic actions of this policy. • The proposal will be unlikely to have any adverse impacts in regard to solar access. • The proposal will be unlikely to have any adverse impacts to existing adjoining properties and satisfactorily addresses the public domain. • The proposal is considered to be consistent with other residential development in the locality and adequately addresses planning controls for the area. • There are no adverse impacts on existing view sharing. 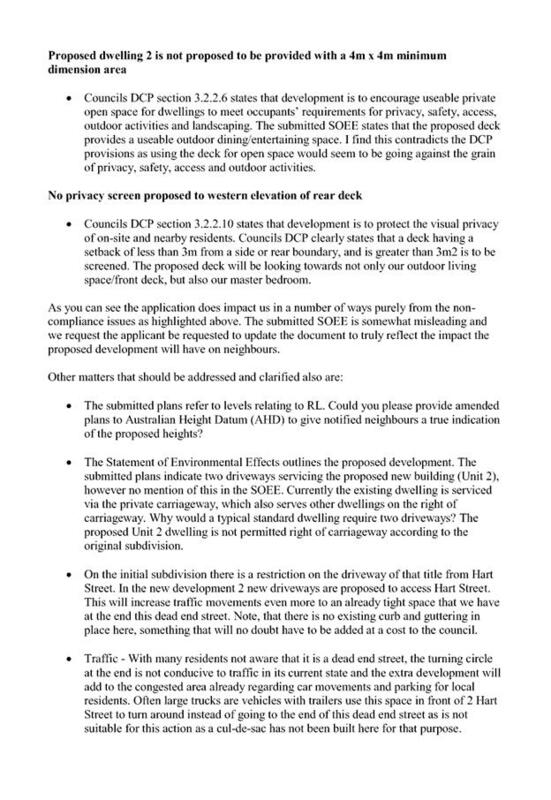 • Privacy impacts from the proposed works are considered to be no greater than what already exists on the site. The proposal will be unlikely to have any adverse impacts in terms access, transport and traffic. The existing road network will satisfactorily cater for any increase in traffic generation as a result of the development. No adverse impacts anticipated. The site is within an established urban context and will not sterilise any significant mineral or agricultural resource. The construction and/or operations of the proposed development will be unlikely to result in any adverse impacts on the existing air quality or result in any pollution. Satisfactory arrangements are in place for proposed storage and collection of waste and recyclables. No adverse impacts anticipated. No adverse impacts. Likely positive impacts can be attributed to the construction of the development and associated flow on effects (i.e. increased expenditure in the area). The proposed development design is satisfactorily responds to the site attributes and will fit into the locality. No adverse impacts likely. One (1) written submission has been received following public exhibition of the application. Loss of privacy due to 4 windows facing the adjoining rear yard (Building 5.5m at 1.1m distance from fence). Privacy screening is not considered to be required for the bedroom windows facing the rear boundary as they are not considered to be high use living areas. There is anticipated to be a degree of impact in regard to privacy from the proposed rumpus room windows facing the rear boundary. The rumpus windows are compliant in terms of setbacks for ¾ of the window length. Given the orientation to the north/west and the separation available to the primary open space area of the adjoining dwellings the privacy impact is not considered to be of such an impact that would warrant refusal of the application. Due to the elevated nature of the site it is considered that privacy will be impacted upon to some degree from any addition to the building and any impacts from the proposed additions will be minor to what already exists. Closeness of the proposed dwelling to the rear boundary at 1.1m. A proposed setback of 1.1m is permissible in that an equivalent area with a setback of 4m is available along the western boundary. 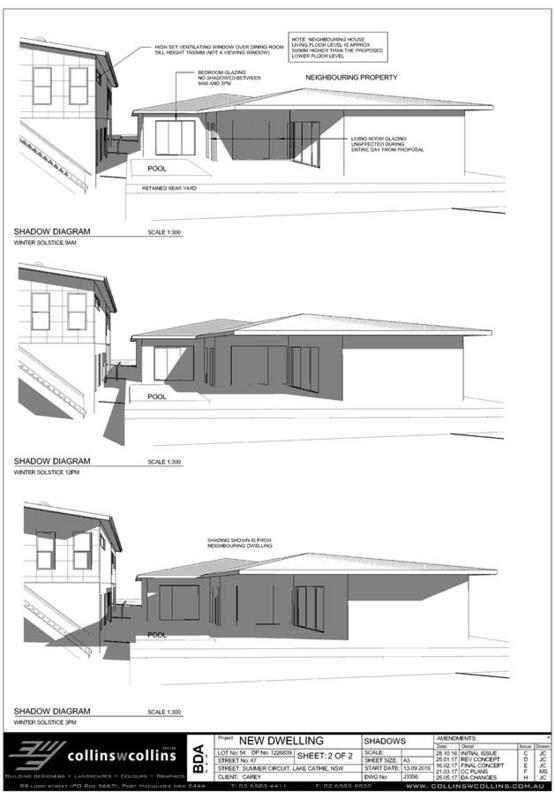 Shadows will not be cast onto the adjoining property from the proposed structure. The proposed roller door at the rear is too close to boundary and may become a workshop. The setback of the roller door is permissible. The owner has advised that the proposed roller door is for easier access to the subfloor storage area beneath the dwelling addition. The application has been assessed in accordance with Section 79C of the Environmental Planning and Assessment Act 1979. The site is suitable for the proposed development, is not contrary to the public's interest and will not have a significant adverse social, environmental or economic impact. It is recommended that the application be approved, subject to the recommended conditions of consent provided in the attachment section of this report. That DA 2017-132.1 for alterations and additions to veterinary hospital at Lot 1, DP 981233, No. 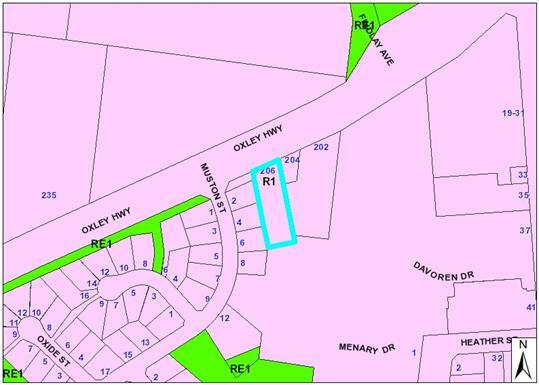 206 Oxley Highway, Port Macquarie, be determined by granting consent subject to the recommended conditions. This report considers a development application for alterations and additions to an existing veterinary clinic at the subject site and provides an assessment of the application in accordance with the Environmental Planning and Assessment Act 1979. Following exhibition of the application, six (6) submissions have been received with one submitter forwarding addendums to add to their submission. The site has an area of 2023sqm. A Veterinary Hospital, as defined in LEP 2011 is a prohibited landuse in the R1 General Residential zone. However, the use of the subject site as a veterinary hospital/clinic is an approved landuse (since 1984) and has been a continuing use since that time. · The original landuse was approved in 1984. The landuse was approved as an ‘undefined’ use. It is therefore an approved use and has been used and occupied for this purpose since 1984. · Additions and alterations to the premises have occurred, with permission, during the ensuing period. · This application seeks additions and alterations to the approved veterinary hospital. 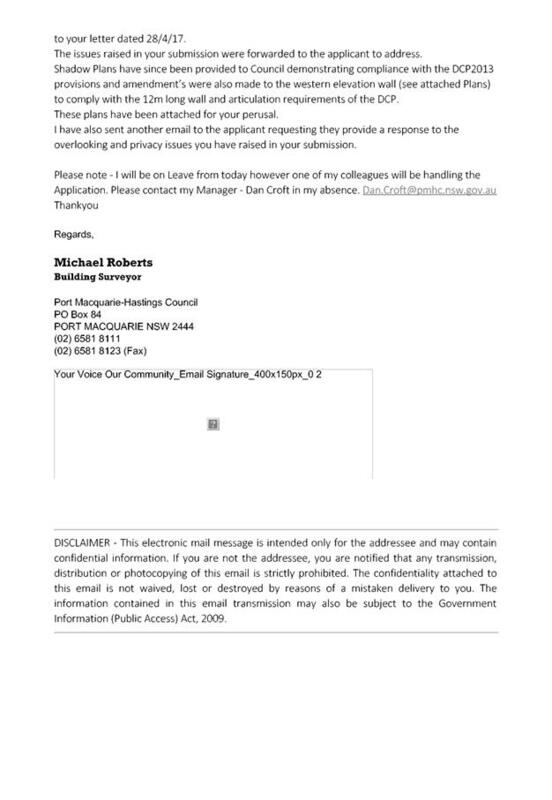 · There are no registered or ongoing complaints on Council’s records regarding the operation of the premises in respect of noise emissions or behaviour of pets on the premises. · Public notification period: 6/03/2017 to 20/03/2017. · Six (6) submissions received during the notification period. · Addendums to submissions received after notification period. The site is shown hatched on the SEPP 71 maps on Council’s GIS system. It is therefore located within a coastal zone noting clause 4 of the SEPP. j) development relying on flexible zone provisions (refer to clause 5.3 of LEP 2011 - Development near zone boundaries unable to be undertaken when SEPP 71 applies). The site is predominately cleared and located within an area zoned for residential purposes. 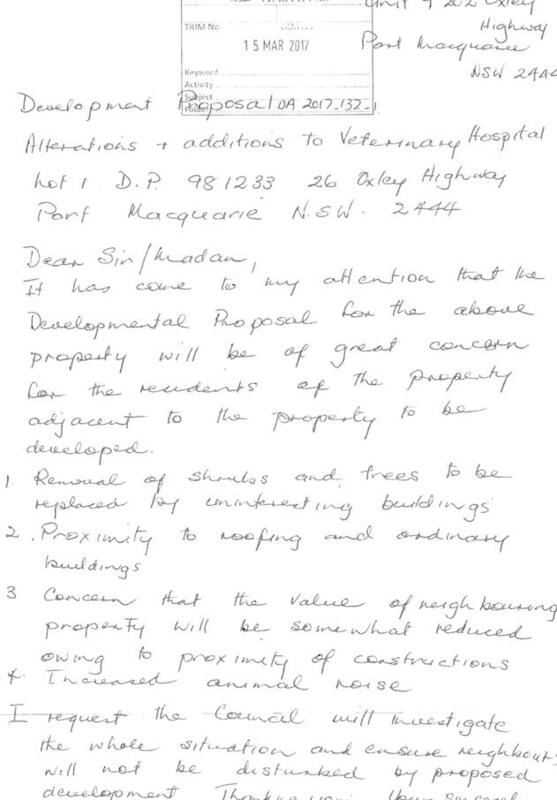 The existing landuse on the site, being a veterinary hospital is an approved and ongoing landuse since 1984. 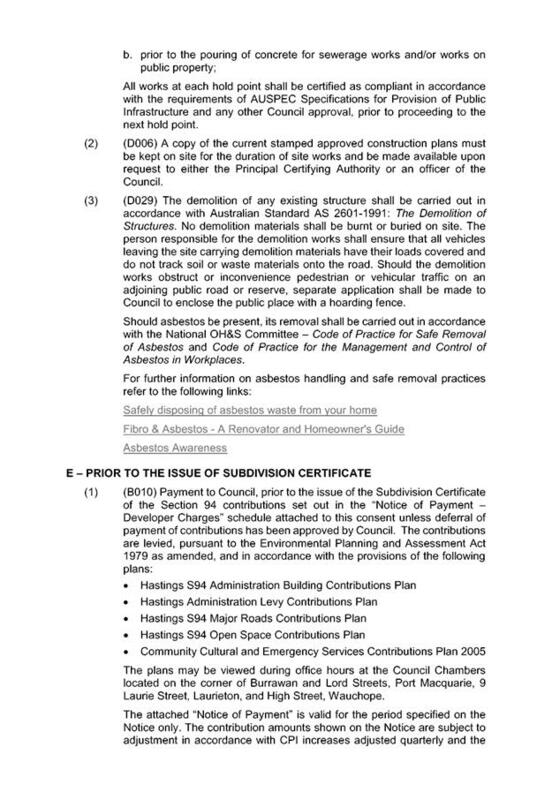 · Clause 2.2 - the subject site is zoned R1 General Residential. 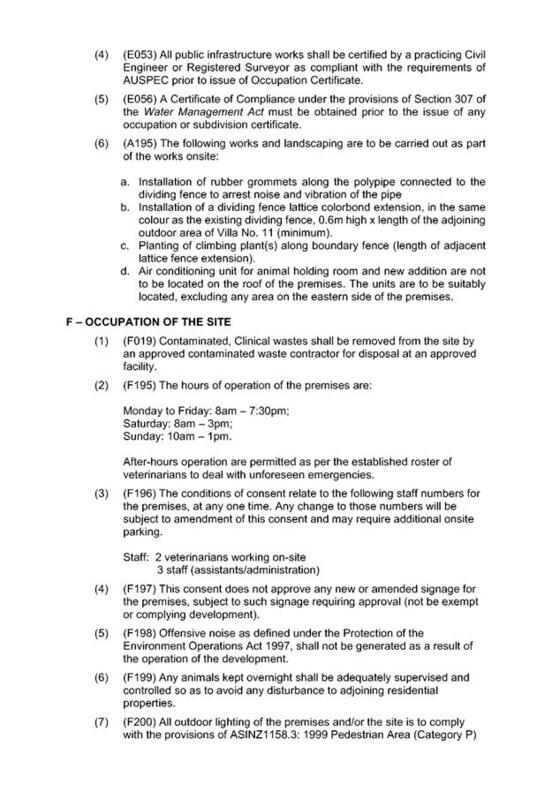 In accordance with clause 2.3(1) and the R1 General Residential zone landuse table, the proposed development, being defined as ‘veterinary hospital’ (in accordance with the LEP definitions) is a prohibited landuse on the subject site. “veterinary hospital” means a building or place used for diagnosing or surgically or medically treating animals, whether or not animals are kept on the premises for the purpose of treatment. • To provide for the housing needs of the community. • To provide for a variety of housing types and densities. • To enable other land uses that provide facilities or services to meet the day to day needs of residents. (ii) that has been carried out, within one year after the date on which that provision commenced, in accordance with the terms of the consent and to such an extent as to ensure (apart from that provision) that the development consent would not lapse. On this basis, ‘existing use rights’ pursuant to Part 4, Division 10 of the EP&A Act 1979 are established for the ongoing use of the site as veterinary hospital. 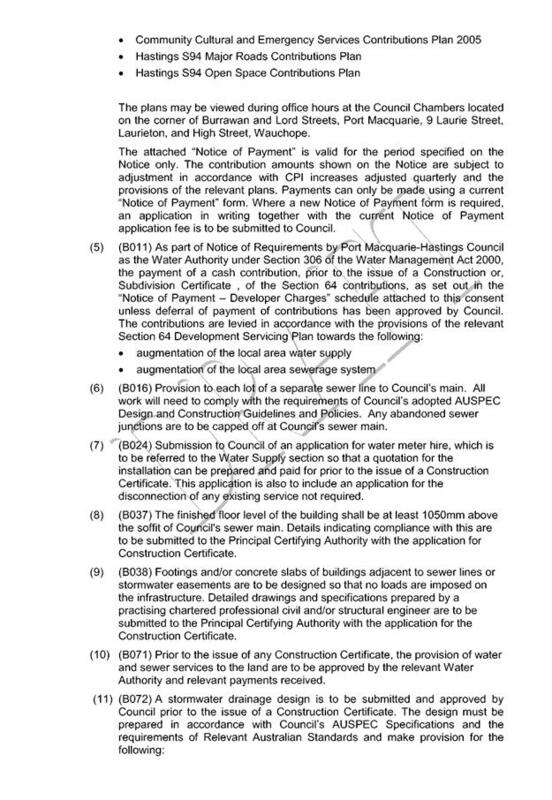 The proposed additions and alterations to the premises, the subject of this application, can be assessed on a merits based assessment in accordance with the current EPI’s and council policies. In accordance with clause 43 of the EP&A Regulations 2000, development consent is required for alteration or extension of buildings and works the subject of existing use rights. The subject application is for the same use and relates to the same land as that originally approved in 1984. The use is not defined as ‘commercial premises’ or ‘light industrial’ and are not therefore limited in regard to the size of addition/extension able to be approved. 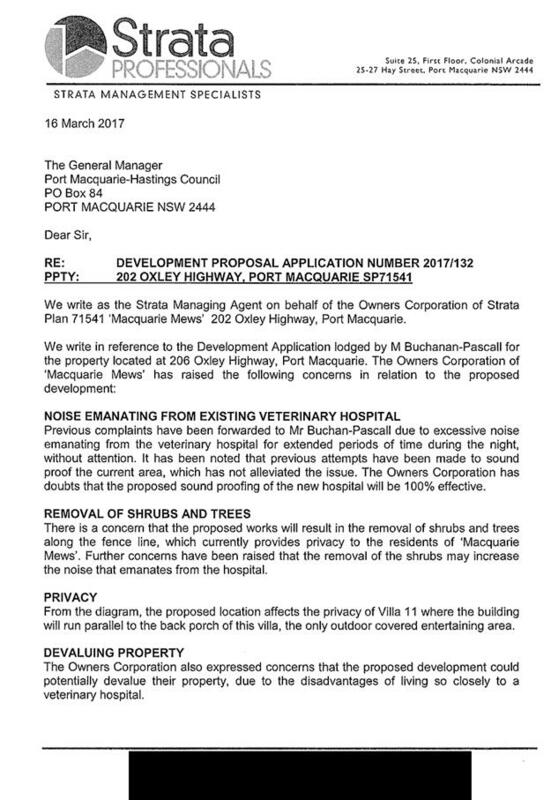 Further, the applicant advises that the proposed is not aimed at intensifying the current use on the site, rather rationalising the existing floor space to provide better pet care facilities that are more practical for staff procedures and care of animals, including insulation of the new premises to address any potential noise emissions from animals. The occupation of the existing dwelling onsite remains unaltered and continues to be directly related to the operation of the veterinary hospital. While located on the subject site it is not part of the proposed works onsite. 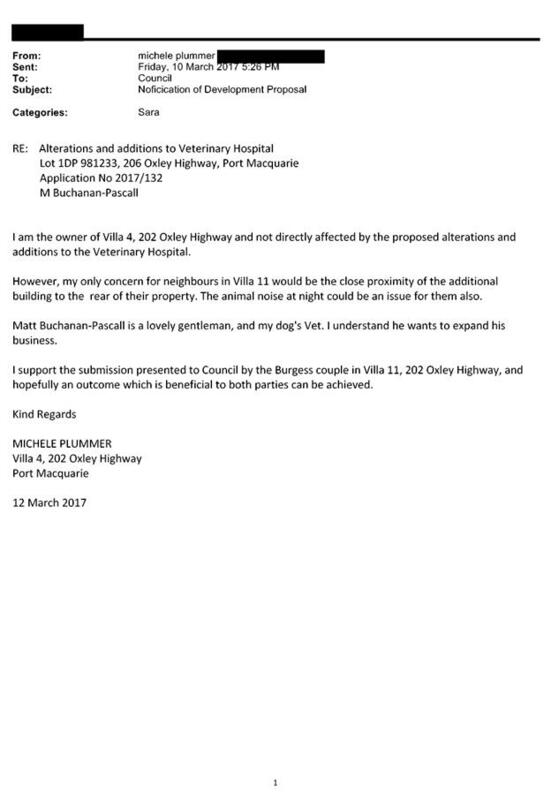 The current application seeks consent to make additions and alterations to the existing, ongoing use of the site as a veterinary hospital. · Clause 4.3, the maximum overall height of the building above ground level (existing) is 2.931m which complies with the standard height limit of 8.5m applying to the site. · Clause 4.4, the floor space ratio of the proposal is 0.23:1 (including the onsite residence and excluding the verandah attached to the staff room at the rear) which complies with the maximum 1.0:1 floor space ratio applying to the site. 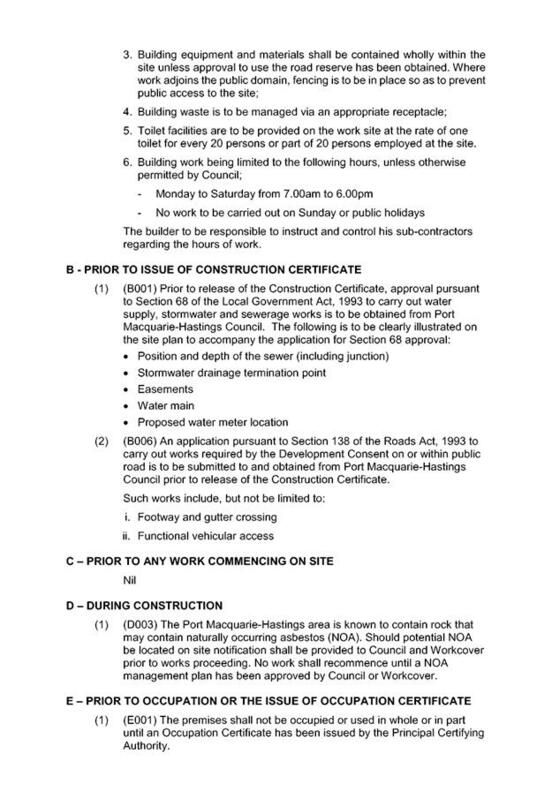 · Clause 5.5 - Development within the coastal zone. Relevant objectives of this clause are addressed by SEPP 71 section - see above. 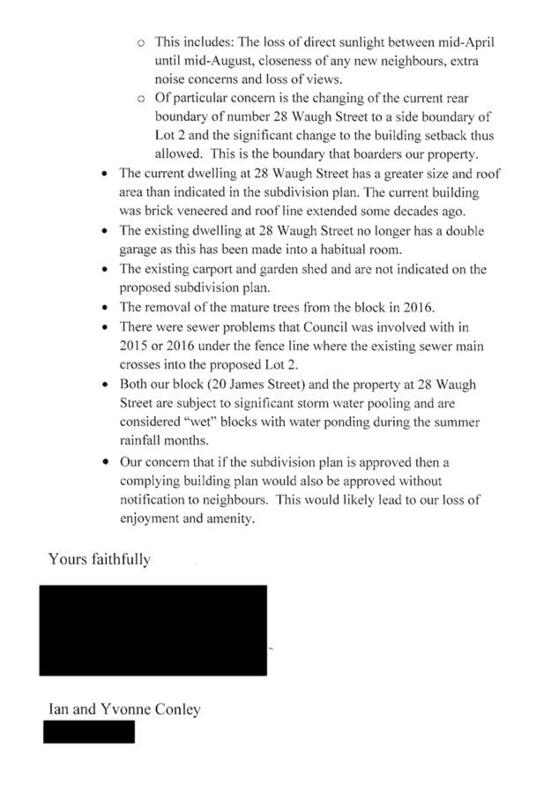 · Clause 5.9 - One tree and some established gardens are required to be removed as part of the building extension as they are located within the building envelope of the new works. This is acceptable in this case. Additional sunlight will be made available to adjoining residential units. Loss of any privacy afforded by the current mature tree is to be addressed via the installation of a lattice/fence extension to the boundary fence, similar to other screening along the boundary fence to the south of the new works. 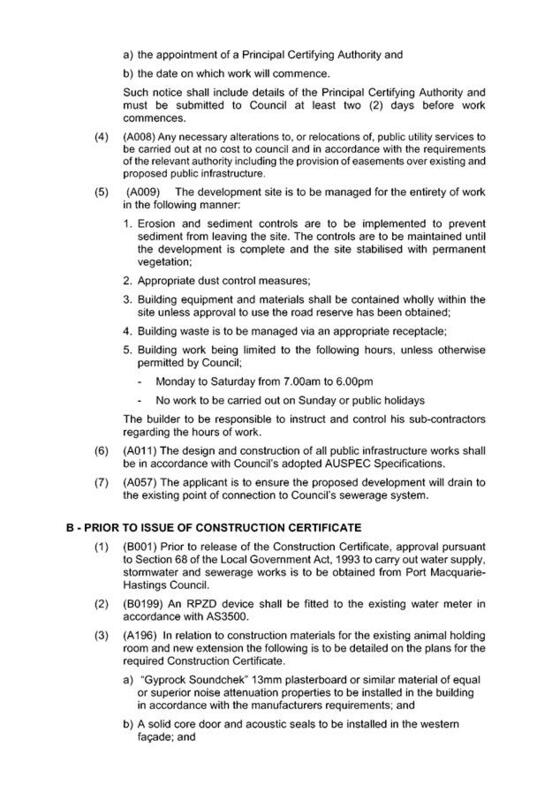 · Clause7.13 - Satisfactory arrangements are in place for provision of essential services including water supply, electricity supply, on-site sewage management/sewer infrastructure, stormwater drainage and suitable road access to service the development. The PMHDCP 2013 does not contain any provisions specific to the subject landuse, being a veterinary hospital, except for traffic and parking provisions under Section 2.5 Transport, Traffic Management, Access and Car Parking. This is addressed below and concludes that the site can comply, subject to conditions of consent. The site has a north-south orientation with pedestrian and vehicle access off the Oxley Highway. It is noted that left-in, left-out applies to properties along this section of the southern side of the highway. Adjoining the site to the north is the Oxley Highway (double lane in both directions with median strip). Beyond the highway is vacant land owned by the Department of Education. Douglas Vale historical site is located immediately west of the vacant Department of Education land (approx. 100m from the subject site). Adjoining the site to the east is a single dwelling (being Lot 50 DP 1051366 - fronting the Oxley Highway) and a multi-unit villa development behind Lot 50, being SP 71541. A number of residential units immediately about the boundary of the subject site. Adjoining the site to the south is residential development owned by the Trustees of the Roman Catholic Church. Adjoining the site to the west is low density residential dwelling owned by a mixture of the NSW Land & Housing Corp and private owners. The existing landuse is a longstanding locally based business since at least 1984 - some 33 years. This proposal does not seek to intensify the current use, rather the applicant states that it to rationalise internal working spaces to better facilitate care of animals and improve work conditions for staff. This was evident upon inspecting the site. Subject to compliance with proposed conditions of consent, the proposal should be able to continue operations on the site within acceptable limits in terms of impacts on the adjoining residential properties. The measures to address potential impact are outlined throughout this report. Overall, the proposal is considered acceptable and reasonable in relation to the natural and built environment, given the history of occupation of the site and its locational context within a zoned residential area. Subject to compliance with proposed conditions of consent, there are no significant adverse impacts that warrant refusal of the application. Currently, a total of five (5) spaces are provided at the front of the site with staff parking provided at the rear of the site, adjacent the existing dwelling and outbuilding. 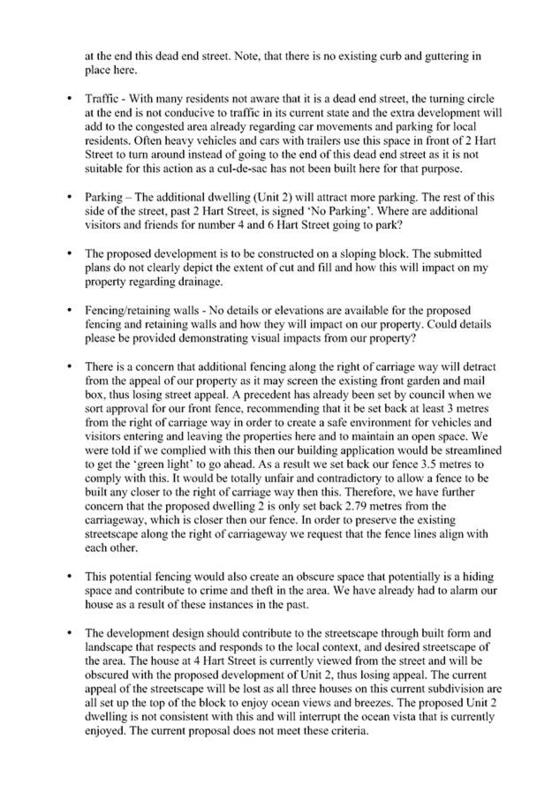 The applicant states that each of the front parking spaces is 2.5m wide. A condition of consent is proposed to ensure client parking complies with design requirements of Australian Standard AS 2890. 3 spaces per vet + 1 space per 2 employees (assistants/administration). Information provided by the applicant in relation to operation of the premises states that there are a maximum of 2 vets at the facility at any one time (one in surgery, one consulting) and a maximum of 3 staff. This equates to a parking requirement of 7.5 or 8 parking spaces for five staff and clients. Five (5) spaces for staff can be provided at the rear of the site - through the gateway, adjacent the managers dwelling and outbuilding. This leaves the 5 parking at the front of the site for clients. This is sufficient for clients of the business. To assist in addressing neighbour concerns regarding on street parking by clients and staff, the proponent has been asked to put a sign up inside the clinic asking all visitors to park on site. Staff will also be asked to park off-street. No condition of consent is proposed to address this matter. The site is connected to Council’s water, sewer, stormwater systems. The site is not a listed heritage item and is not located within a Heritage Conservation Area. Douglas Vale historical homestead and vineyard is located north west of the subject site, separated from the site by the double lane Oxley Highway. The proposed works, located at the rear of the existing premises, will not impact on the historical significance of Douglas Vale. One mature tree at the rear of the existing premises is located within the building envelope of the proposed addition. It requires removal to facilitate the development and is considered acceptable. Concerns have been raised regarding loss of privacy due to removal of the tree. A condition of consent is proposed requiring the installation of the boundary fence lattice extensions, with climbing plant to screen the building and address any perceived loss of privacy. This has been discussed and agreed with the proponent. Overall, the removal of the tree is considered acceptable. “The proposal seeks to reduce any noise impacts emanating from both the existing and proposed building. The existing area labelled ‘Animal Holding’ is an area where animals will be held, either prior to X-Ray/Surgery, or following X-Ray/Surgery. Generally, all animals kept within this area will be sedated or under a general anaesthetic, and under the constant supervision of staff. Animals will not be kept within this area outside normal operating hours of the Veterinary Hospital. Whilst it is not expected that the animals held within this area will make much noise, it is proposed to internally line the existing concrete block wall (approximately 190mm thick) with a timber or metal frame, and 13mm ‘soundcheck’ plasterboard to assist in reducing any noise emanating from the room. The proposed rooms labelled “Prep”, “X-Ray” and “Procedure Room” are areas to be used for procedures on animals. All animals within this area will be either preparing for a procedure or undertaking a procedure and will be sedated or under a general anesthetic. Accordingly, animals within these areas are not expected to make much noise. Construction of this section of the building is proposed to have; the external walls constructed of concrete blocks, contain no window or door openings on the eastern or southern elevations and are to be internally framed and lined with 13mm ‘soundcheck’ plasterboard on the eastern and southern elevations. The only area within the Veterinary Hospital where animals will be kept for observation outside of normal operating hours will be within the room labelled “holding room”. Even through this area is not located adjacent to the eastern lot boundary wall, to assist in further reducing any noise impacts; it is proposed to line the internal walls with 13mm ‘soundcheck’ plasterboard. Council’s EHO advises, that combined with the use of concrete block external building material, is sufficient as a noise abatement measure in this case. The after-hours management of the premises by a resident vet/staff member(s) also assists in addressing any onsite issues as they arise. 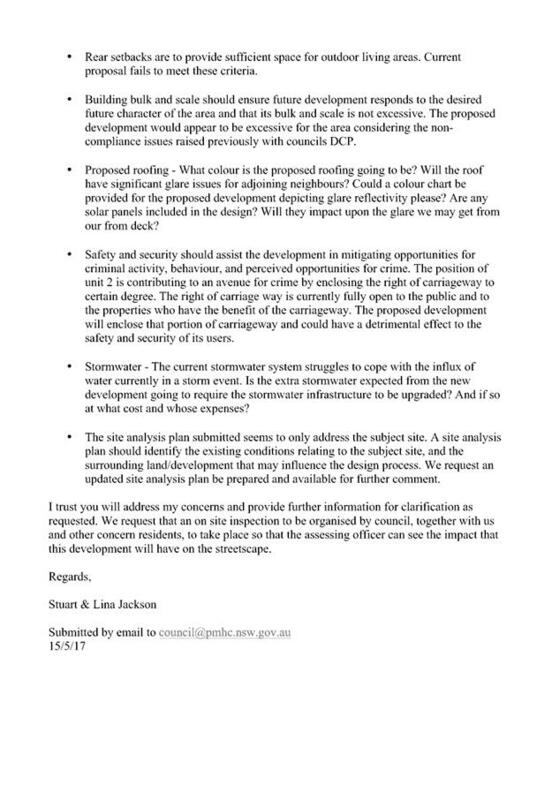 Lesser but more continuous noise and amenity issues raised by adjoining residents relate to the poly pipe attached to the dividing fence and potential siting of the air-conditioning unit on the roof of the new addition. The proponent has acknowledged the rattling of the pipe on the metal fence and is to address it by installing rubber grommets to absorb vibrations. This is considered adequate to address this matter and will be reinforced via condition of consent. A condition of consent is proposed requiring the air conditioner to be located at ground level away from the boundary fence. Both matters have been discussed and agreed by the proponent. The pump adjacent to the rear outbuilding is necessary for plumbing and drainage of the rear outbuilding. It operates when the sink within that building is used. The proponent states that the building is currently used as a staff room and used intermittently on any given day. It was confirmed during the site inspection by Council staff. This level of use is considered reasonable in this case. The room is used predominantly during business hours, not after hours and the pump does not operate for long periods at any one time. The proposed development will be unlikely to create any concealment/entrapment areas or crime spots that would result in any identifiable loss of safety or reduction of security in the immediate area. The existing onsite residence provides a high level of security for the site. The vet clinic is a longstanding landuse on this site. Discussions with both the proponent and adjoining residents reveals that, for the most part, relations between the two landuses has been amicable over the long term. A search of Council’s CRM records did not reveal any repeated or ongoing complaints about noise or animals on the site. 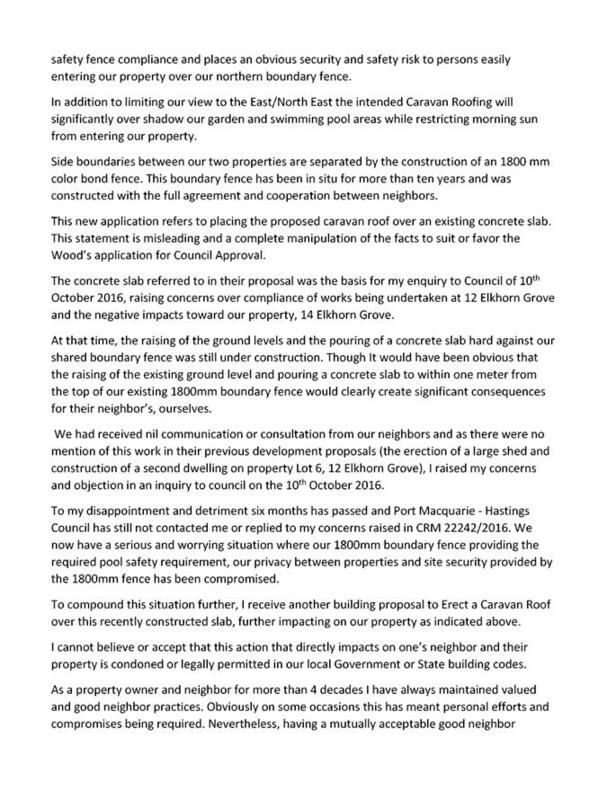 Long term residents of the adjoining units have raised some night time disturbances over the years and cited lack of action on behalf of the proponent. This cannot be corroborated either way. Based on anecdotal evidence the two landuses can generally exist cordially. The onsite manager’s/vet’s residence can assist with after-hours issues with animals should they arise. This is considered a positive management measure for this landuse in this location. Submissions have been received citing potential devaluation of adjoining units due to the proposal. There is no evidence presented to support this supposition. A number of conditions of consent are proposed to address neighbours’ submissions regarding future amenity of their residences. These have been discussed with the proponent and agreed. On this basis, the development is longstanding landuse, established on the site, prior to the construction of the adjoining residents units. The conditions of consent, as recommended, are proposed to address environmental and built form matters raised by submitters. 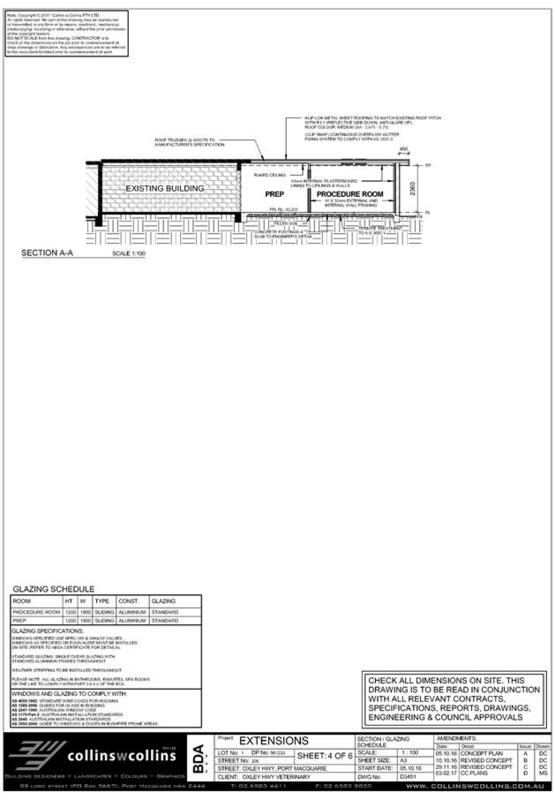 The proposed addition to the existing building is single storey, concrete block construction with metal sheet roofing. The built form satisfactorily responds to the site attributes and locational context of the premises, particularly its location relative to the adjoining residential villas adjacent the eastern boundary. A single storey addition results is significantly less impact than a two storey development which could be permissible on this site in accordance with local planning policies and its residential zoning. The single storey construction provides light, sunlight and natural ventilation along the eastern side of the building. The addition contains no openings and the metal roofing is to be low pitched with reflective side down, anti-glare side up. It fits with the existing single storey building. One submission raised the potential for glare and heat from the roof of the new addition into an adjoining villa. As stated above the roof will be anti-glare with a low pitch where midday to afternoon sun will radiate upwards. This submission is not supported. No potential adverse impacts identified to neighbouring properties with the construction of the proposal. Standard condition of consent proposed for construction hours. 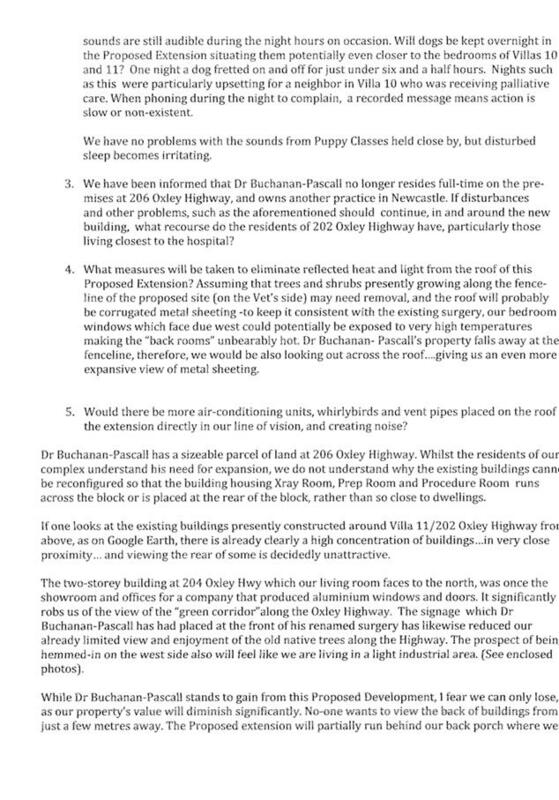 Subject to the existing veterinary premises continuing operations as outlined in this report, the cumulative impacts of this landuse on the site are considered reasonable in this case. 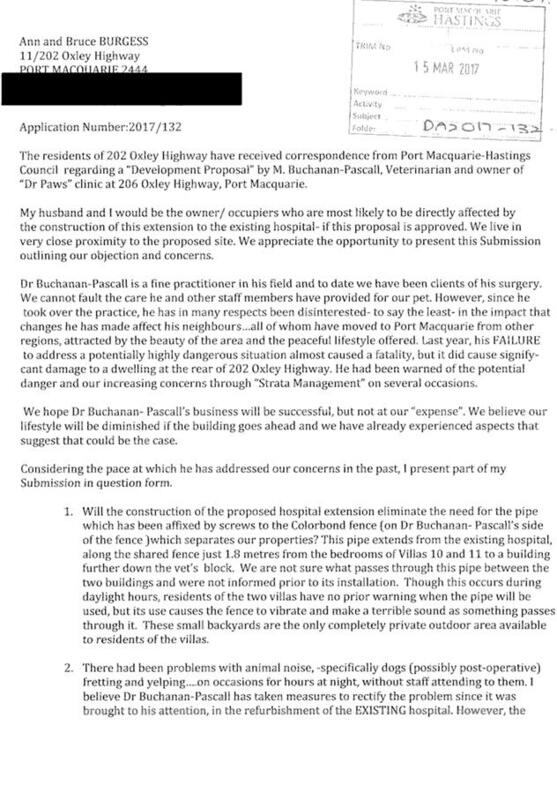 The site has a longstanding recognised approval for use of the site as a veterinary clinic. Subject to ongoing compliance with noise emission criteria, the use is reasonable on this site. It provides a community service to pet owners at local and district level. The site is located adjoining residential units with private open space areas facing the boundary of two properties. 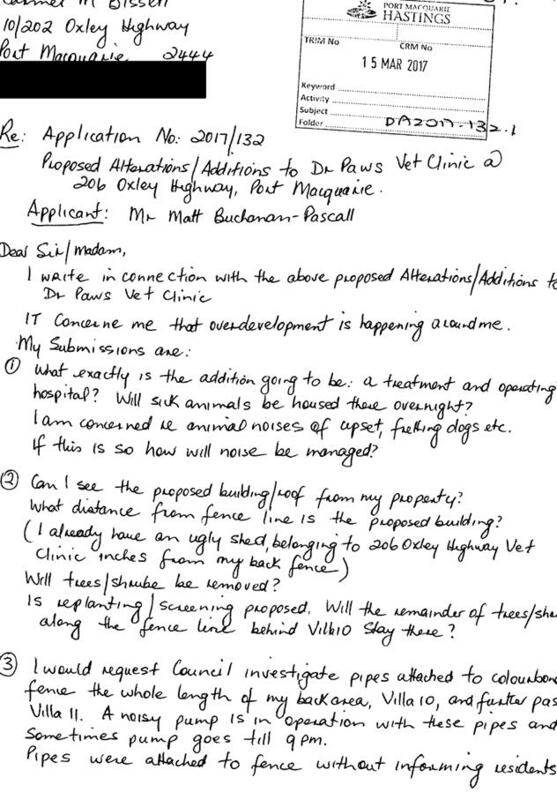 This is not ideal and the vet clinic was the original landuse, not the residential units. Notwithstanding, adequate measures are in place to ensure both landuses are able to co-exist within reasonable limits. Six (6) written submissions (plus addendums) have been received following public exhibition of the application. Noise emissions from the premises - complaints to proponent forwarded but not attended to. The proposed addition is single storey, to be construction of concrete brick with “soundcheck” plasterboard lining, concrete block construction. There are no openings in the eastern elevation of the building, adjacent the eastern boundary. The external door on the western side of the existing building is to be replaced with a solid core door to further reduce any noise emissions from the premises. These mitigation measures are considered adequate to address potential noise emissions along the eastern boundary of the site. Removal of trees and shrubs - loss of privacy to adjoining residents. The removal of the trees and shrubs are required as they are located within the building footprint or directly adjoining it. It is acknowledged that this will change the outlook from the outdoor area of the adjoining units from greenery to the built form of the new extension. This was discussed with the proponent and agreed that it could be mitigated by installing a dividing fence lattice extension and planting a climber to grow up and over that extension as a measure to re-establish a level of amenity and green outlook. Further the air conditioning unit of the new addition is not to be placed on the roof, rather at ground level away from the side boundary. These measures are proposed conditions of consent to address this matter. Privacy - extension of building along the eastern boundary adjacent Villa 11. Privacy will not change as a result of the building extension as there are no openings on the eastern elevation of the animal holding room or proposed procedures room. Rather, the change is from a green outlook to a built form outlook. As above, a mitigation measure is proposed to soften the built form appearance from the private terrace of the adjoining unit. 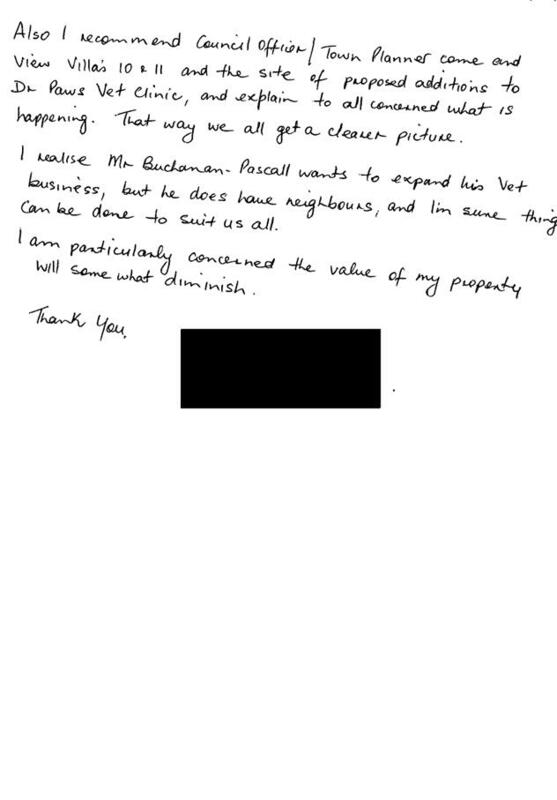 Devaluing property - due to disadvantage of living close to vet clinic. Discussed in the report above. There is no evidence presented that is the case. The vet clinic is a longstanding use. Subject to compliance with consent conditions the proposal is considered acceptable. On-site parking has been assessed as being capable of complying. 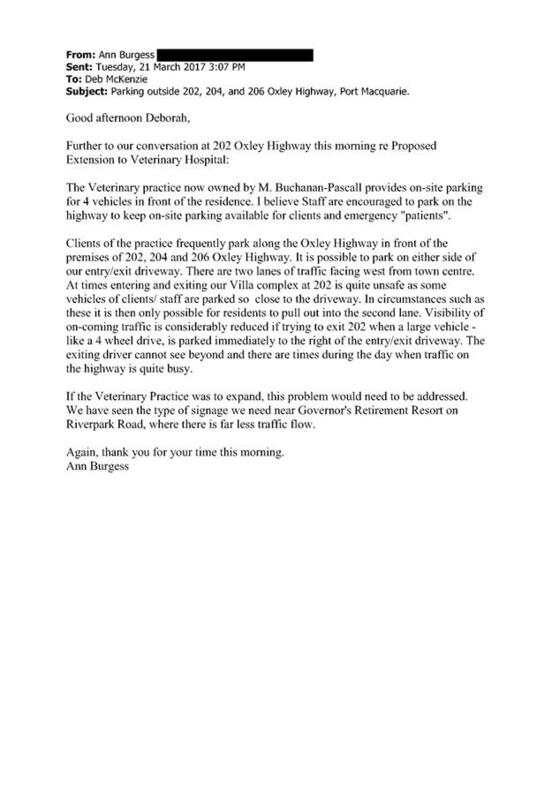 Conditions of consent are proposed to address onsite parking, including staff parking at the rear of the site, leaving client parking at the front of the site, directly accessible from the highway via the existing crossover and driveway. The proponent has acknowledged this matter and is to install rubber grommets along the pipe to assist vibration of the pipe against the metal fence. As an amenity issue a condition of consent is proposed to ensure this will be completed. Dogs fretting and barking, especially at night. Discussed in the report above. The existing animal holding room and the procedure rooms are to be lined with sound proofing plasterboard to mitigate noise emission from the building. The new addition is to be constructed of concrete block with the “soundcheck 13mm” plasterboard lining. During an inspection of the premises it was observed that animals are kept away from the eastern wall where possible. Further, the vet/staff living onsite can assist with any after-hours matters. A check of Council’s CRM system of complaints did not reveal any history of complaints about the premises. The proponent advises that the primary aim of the proposed works is to rationalise the current practice, providing improved staff work area and enhanced animal care facilities onsite. The hours of operation are to be reinforced via a proposed condition of consent, together with staff onsite. Staff: 2 vets working on-site and 3 staff at any one time. The proposal is an overdevelopment of the site. The proposed development is a 37.8sqm addition and internal alterations to the existing building. The existing premises is 241.8sqm (excluding the verandah of the staff room and residence). The residence is estimated to be 220sqm. This equates to a FSR of 0.23:1. The site is located in an area with a residential FSR of 1.0:1. The proposal is single storey, low profile design and construction. The proposal does not result in an overdevelopment of the site. This submission is not supported. Request for site visit and inspection by Council officer. A site inspection with residents of the adjoining villas was conducted. The issues raised by submitters were inspected and discussed with them and subsequently with the applicant and proponent during a site inspection of the subject site on 4 April 2017. A number of matters raised by submitters are proposed conditions of consent or incorporated into the submitted plans and will be addressed as part of the construction. Section 94A Contributions are not applicable as the cost of development is less than $100,000. Development contributions will be required towards augmentation of town water supply and sewerage system head works under Section 64 of the Local Government Act 1993. The application has been assessed in accordance with Section 79C of the Environmental Planning and Assessment Act 1979. The applicant has established that the site is subject to ‘existing use rights’ and the land has been ongoing use since its original approval in 1984. The proposed additions and alterations are permissible pursuant to the provisions of the EP&A Regulations 2000. 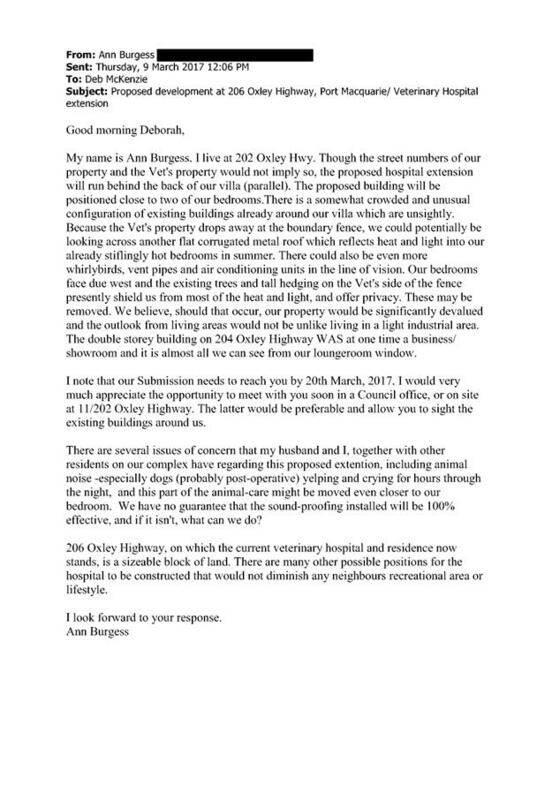 The site is generally suitable for the proposed works, is not contrary to the wider public's interest and while it is acknowledged that ongoing use of the land as a veterinary hospital has some impact on residential amenity of residential units immediately adjoin the subject site, the applicant has proposed mitigating measures, including noise attenuation measures in the construction of the building to address the locational context of the premises. It is recommended that the application be approved, subject to the recommended conditions of consent provided in the attachment section of this report and that those who made submissions be advised of the outcome of the application. This report considers a development application for dwelling at the subject site and provides an assessment of the application in accordance with the Environmental Planning and Assessment Act 1979. Following exhibition of the application, one submission has been received. The site has an area of 508m2. 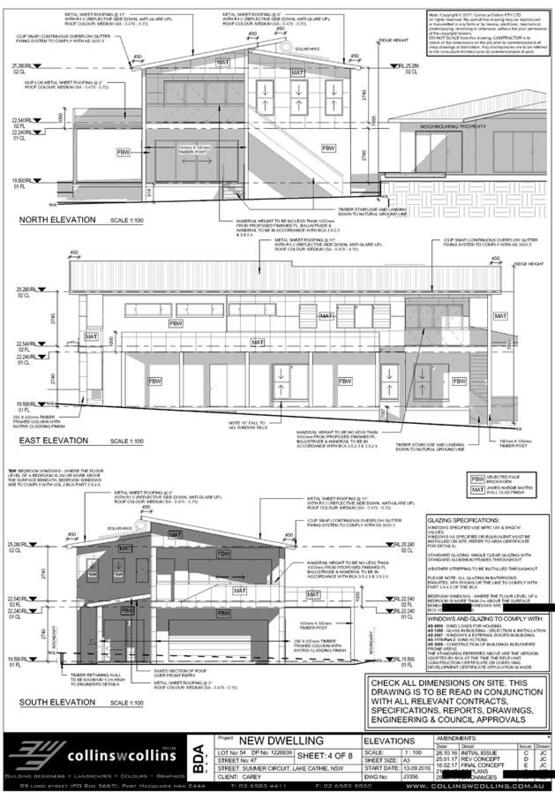 · Proposal is for construction of two-storey single detached dwelling. 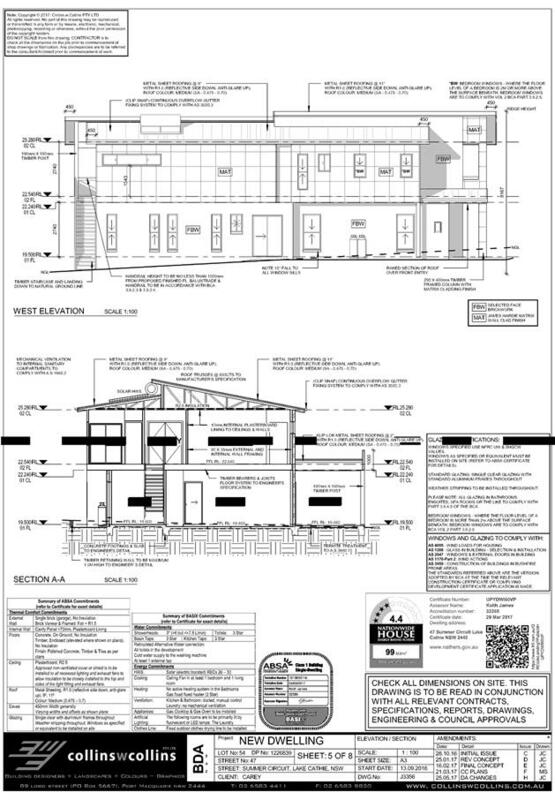 · Dwelling is to contain 4 bedrooms with double garage. · Access is from Summer Circuit. · Submission received from adjoining owner on western side of subject site. With reference to clauses 6 and 7, the subject site is less than 1 hectare in area and does not involve the removal of any trees. The site forms part of the Lake Cathie - Bonny Hills (Area 14) KPoM and complies with the aims and objectives. No further investigations are required. 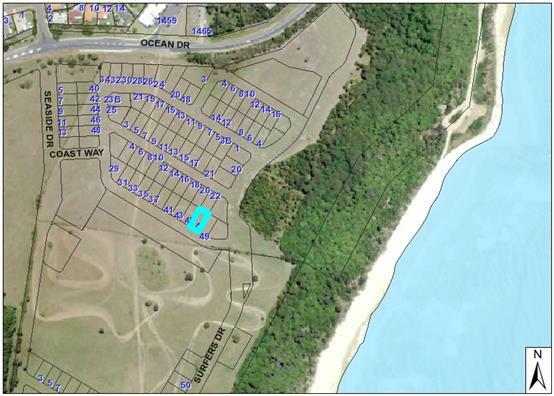 The vacant site is part of the newly created Seawide Estate at Lake Cathie. The subject land is not identified as being potentially contaminated and is suitable for the intended use. 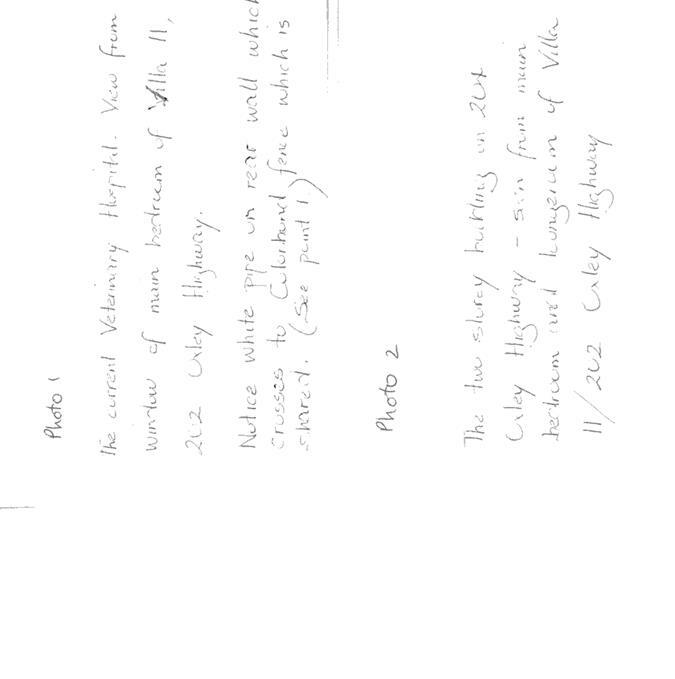 The site is located within a coastal zone as defined in accordance with clause 4 of SEPP 71. 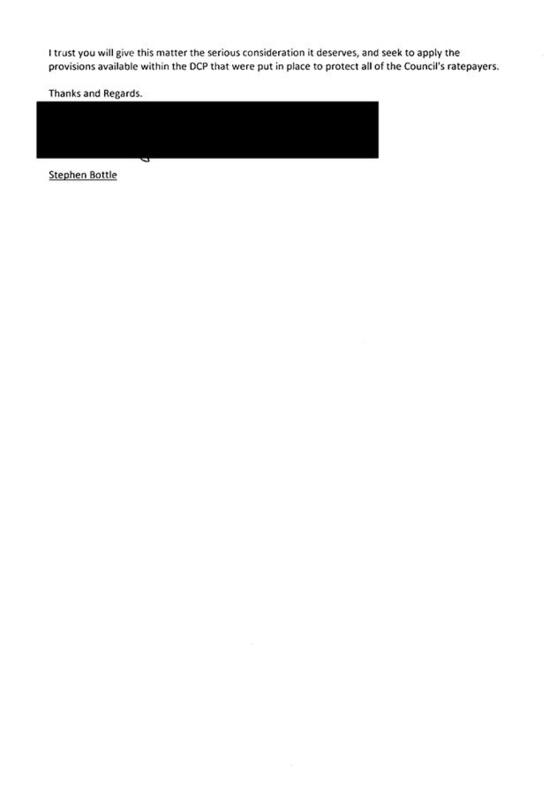 In accordance with clause 5, this SEPP prevails over the Port Macquarie-Hastings LEP 2011 in the event of any inconsistency. g) reduce the quality of the natural water bodies in the locality. The site is predominately cleared and located within an area zoned for residential purposes. A BASIX certificate (806339S) has been submitted demonstrating that the proposal will comply with the requirements of the SEPP. It is recommended that a condition be imposed to ensure that the commitments are incorporated into the development and certified at Occupation Certificate stage. · Clause 2.2, the subject site is zoned R1 General Residential. In accordance with clause 2.3(1) and the R1 zone landuse table, the dwelling (or ancillary structure to a dwelling) is a permissible landuse with consent. · Clause 4.3, the maximum overall height of the building above ground level (existing) is 8.167 m which complies with the standard height limit of 8.5 m applying to the site. · Clause 4.4, the floor space ratio of the proposal is 0.57:1.0 which complies with the maximum 0.65:1 floor space ratio applying to the site. · Clause 7.5 – Koala Habitat – The site forms part of the Lake Cathie (Area 14) KPoM. As no trees are to be removed no adverse impact to habitat is expected. 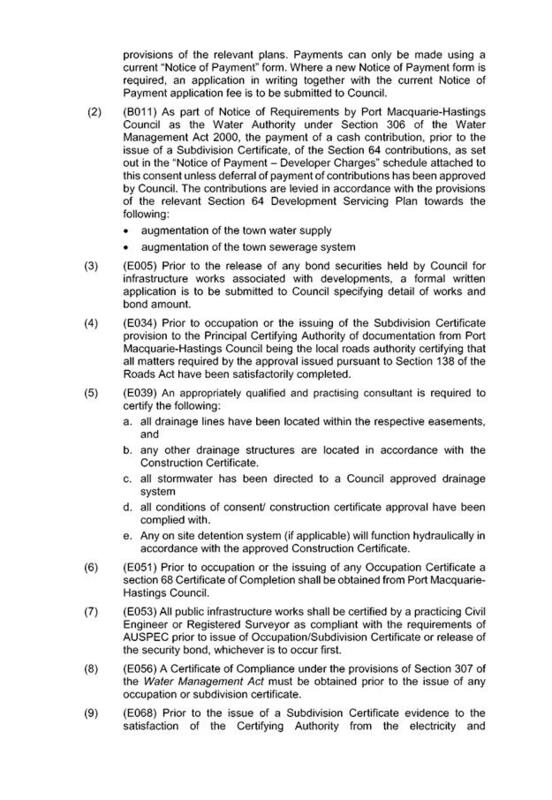 · Clause 7.13 - satisfactory arrangements are in place for provision of essential services. Total 57.14% of building width. In this case the carport is an open structure that does not add the visual dominance of the solid door construction of the garage. It is not antipathetic to the objective of this provision. No - see discussion under submission section below. 5m crossover (31.25% of site). Complies. 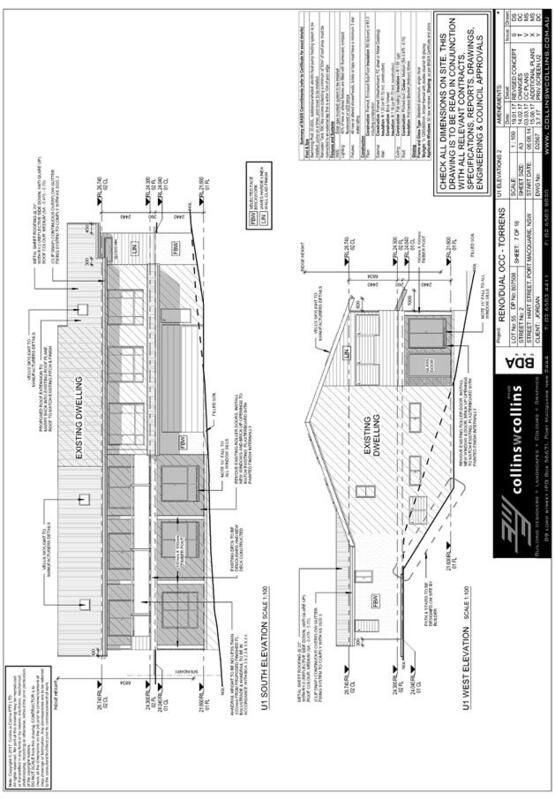 Proposed rear setback = 6.44m to edge of rear stairs and 7.54m to rear wall of dwelling. 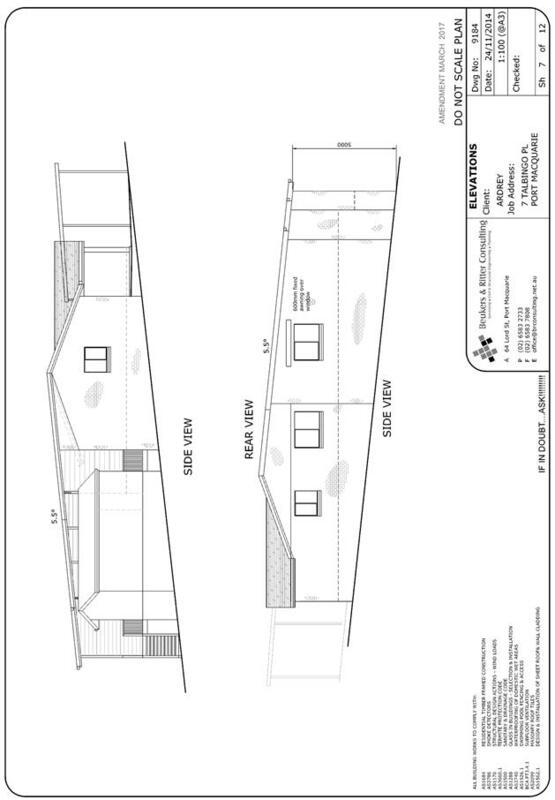 Eastern boundary: 1.0m to carport and 4.5m to wall of dwelling. Western boundary: 1.0m at rear of the building stepping into 2.0m toward front of dwelling. Western boundary: 1.0m to wall of dwelling. No – see discussion under submission section below. Rear ground floor level private open space with direct access from rumpus room: patio (3.26m x 5.26m - 17.15sqm) + 6.44m x 16.0m - 103sqm). Ground floor to be obscured by proposed boundary fencing - 1.8m high. Acceptable. Upper floor western windows of dining area high set with window sill >1.5m above FFL. Windows of low traffic areas of study, toilet, bedroom 2 are narrow, vertical windows. Upper floor eastern bedroom window are high set with window sill >1.5m above FFL. Kitchen windows proposed to be fitted with movable louvers to screen and filter sun access from the east. First floor deck is oriented to the east and north. Separated from western boundary by the dining area (6.2m from that boundary). Stairs up to the deck located at rear of dining room. • The proposal satisfactorily addresses the streetscape of Summer Circuit and the public domain. • There is a single storey dwelling currently under construction on the western side of the subject site (No. 45 Summer Circuit). • The eastern, north-east and north-west lots that adjoin the site are currently vacant. • Dwellings are approved on the lots adjoining the site to the north (No. 20 & 22 Aquarius Ave). • There is no adverse overshadowing impacts. 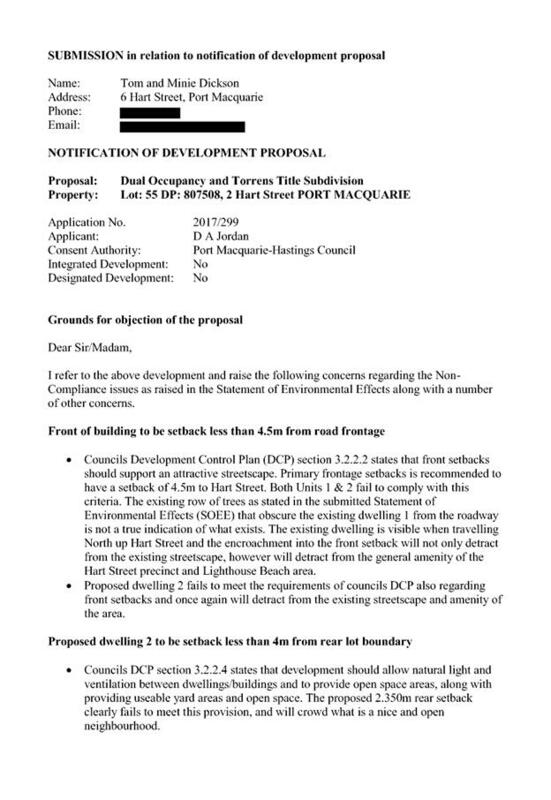 The proposal does not prevent adjoining properties from receiving 3 hours of sunlight to private open space and primary living areas on 21 June. Services available – details required with S.68 application. Construction of the proposed development will not require any removal/clearing of any vegetation and therefore not have any adverse impacts on biodiversity or threatened species of flora and fauna. Section 5A of the Act is considered to be satisfied. Satisfactory arrangements will be in place for storage and collection of waste and recyclables. No adverse impacts anticipated. Given the nature of the proposed development and its location the proposal is unlikely to result in any adverse social impacts. No adverse impacts. Likely positive impacts can be attributed to the construction of the development and associated flow on effects (ie increased expenditure in the area). One submission was received relating to siting, design and layout of the dwelling as it relates to the adjoining new dwelling located on the western side of the property. The assessment of the application has determined that the proposal is acceptable in terms of the LEP 2011 and DCP 2013 low density residential provisions. The proposed development is not expected to have any adverse cumulative impacts on the natural or built environment of the locality. One written submission has been received following public exhibition of the application. · The submission received has been reviewed and addressed in detail with the applicant and the submitter. Council officers have undertaken to resolve these matters where possible. Amended plans were submitted to address the issues raised or alternative solutions reiterated as submitted. 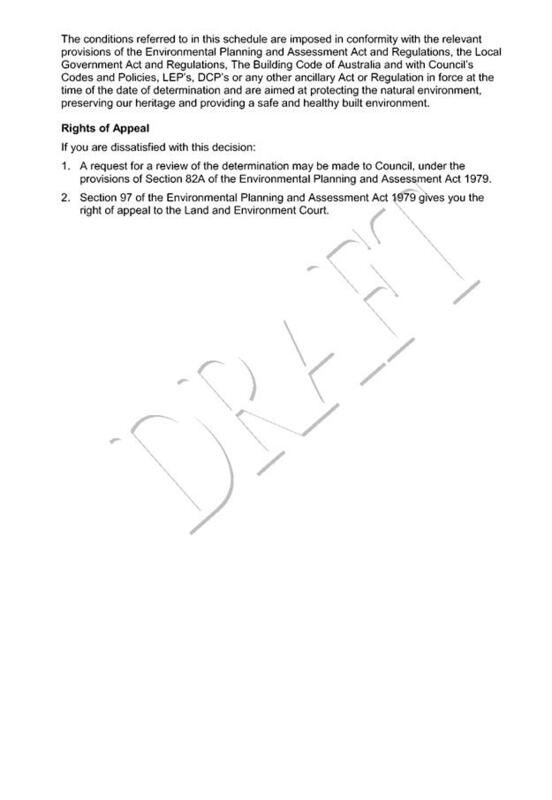 · In assessing any development application in accordance with a locally adopted Development Control Plan (DCP) Council is subject is subject to Section 79C3(A) of the Environmental Planning and Assessment Act 1979 (“the Act”). 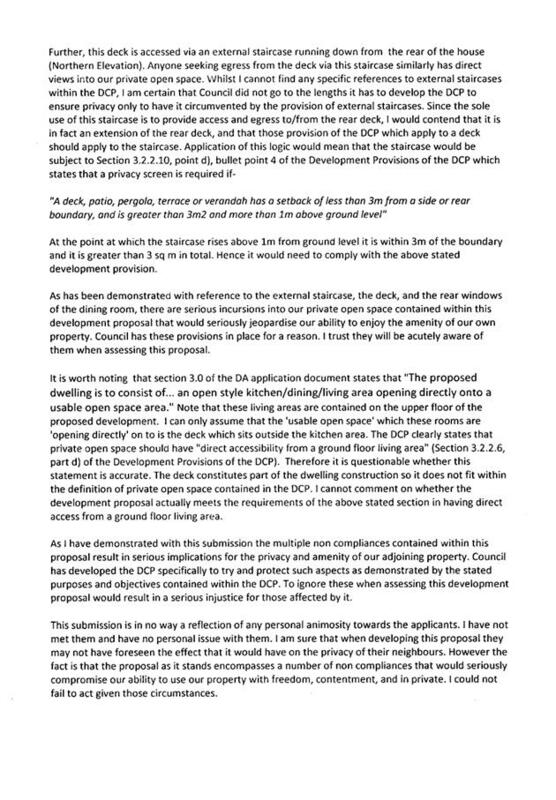 This requires Councils “to be flexible in applying those [DCP] provisions and allow reasonable alternative solutions that achieve the objects of those standards for dealing with that aspect of the development”. The principal purpose of the DCP is to provide guidance to persons carrying out development .....it will be used by Council and landowners as a guideline at the time of preparation and assessment of development applications. Both the DCP and the Act require flexibility where a reasonable alternative solution is presented. In this case the applicant seeks three DCP variations, presenting alternatives through design solutions and/or justifications for each. 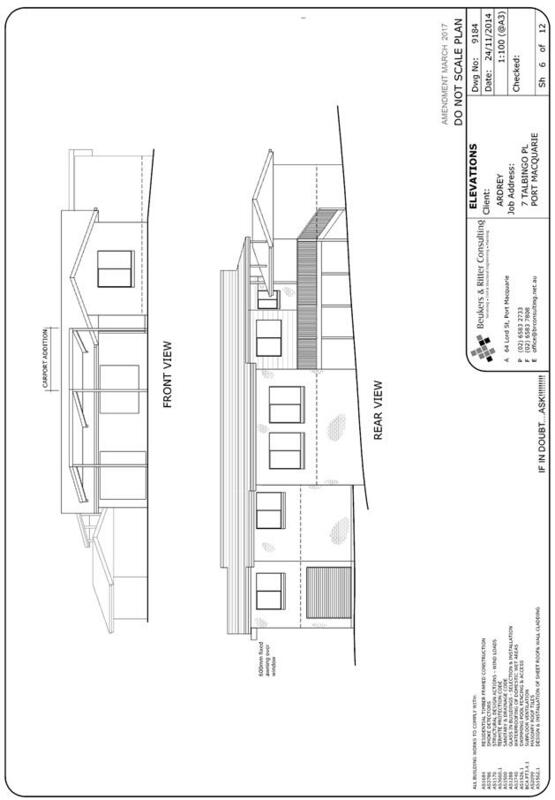 The assessment of the application has addressed the stated purpose of the DCP for development of a two storey single detached dwelling. The design, layout and siting of the dwelling has taken into consideration the provisions of the DCP and the matters of concern raised by the adjoining neighbour to the west. The proposal is considered to be reasonable. The variations requested by the applicant have been considered in relation to the provisions of the HLEP 2011 and DCP 2013. The plans comply with the ground floor side setbacks. The plans do not provide for a 3m setback to the western boundary at first floor level. 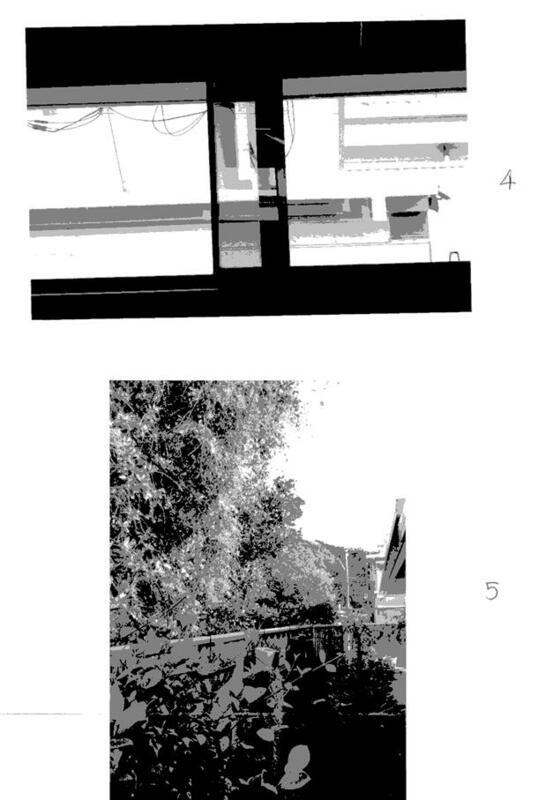 The applicant submitted shadow diagrams that demonstrate that the primary living area and primary private open space area of the allotment to the west receives the minimum 3hrs of sunlight between 9am - 3pm on 21 June. The proposed 900mm setback is therefore considered acceptable. The original plans submitted with the DA did not provide any wall articulation along the western facade. Revised plans were submitted that comply. In order to give due consideration to this matter a comparison of the setbacks of the proposed dwelling and the approved dwelling plans was undertaken. The submitter’s dwelling has a stepped rear setback from west to east of 4.26m to the wall of the family room, 9.17m to the wall of the meals area (under the alfresco area) and 12.78m to the wall of bedroom 1. The proposed dwelling has a setback of 7.54m to the wall of bedroom 4 (ground floor level) and dining area (first floor level). The length of the dining area is approximately 5m, taking the southern end of the dining area approximately in line with the northern wall of Bedroom 1 of the western dwelling. Therefore the only part of the two storey dwelling that will be prominent from the western property is the dining area and rear stairs (that portion that can be seen above the 1.8m high side boundary fence). The setback of the western dwelling is oriented towards the north-east. While up to 5m of the two storey dwelling will be visible from the living area of the western dwelling. The larger than required rear setback of the proposed dwelling provides ample access to natural light, ventilation and outlook to the north-east for the western dwelling. 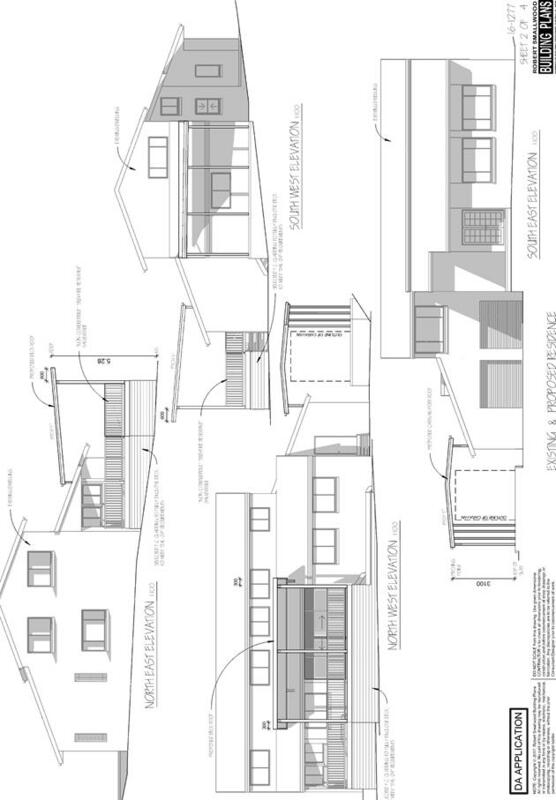 A compliant two storey dwelling, setback only 4m from the rear boundary would reduce the outlook and amenity as large full length windows may be possible with a 3m setback, having an increased impact in terms of overlooking and privacy. The proposed dwelling’s first floor living and deck area is located on the north-eastern side of the building, away from the western neighbour. On this basis, the proposed siting and orientation of the proposed dwelling is considered an acceptable design solution in this case. The submitter suggested the rear stairs be relocated to the eastern side of the deck. This was discussed with the applicant and declined. The open space area on the eastern side of the deck provides side access to the rear of the block and will require an access ramp in the future to provide that access. The owners wish to keep that area cleared. Additionally, the applicant contends that it’s not required. Overall, the proposal is considered to have been designed to prevent any significant overlooking and loss of privacy to the adjoining the property. 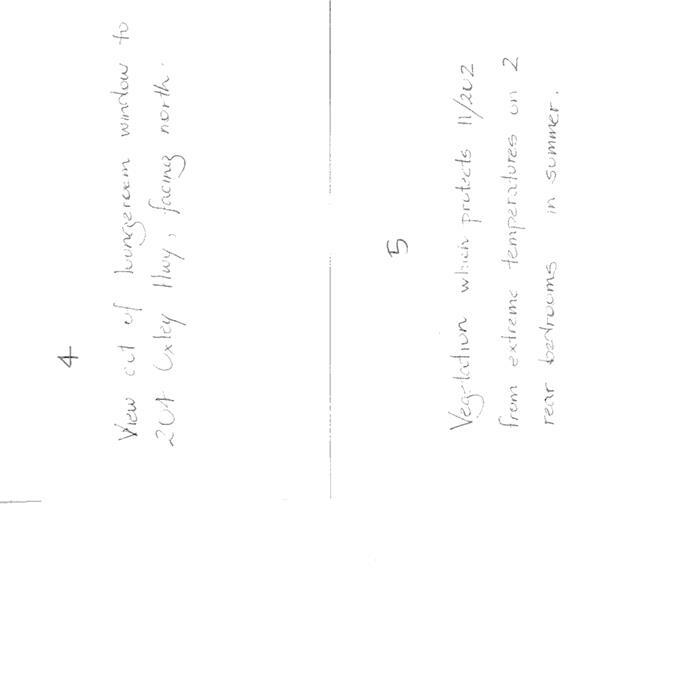 · Shadow diagrams were requested and submitted by the applicant. These were provided to the submitter for review. 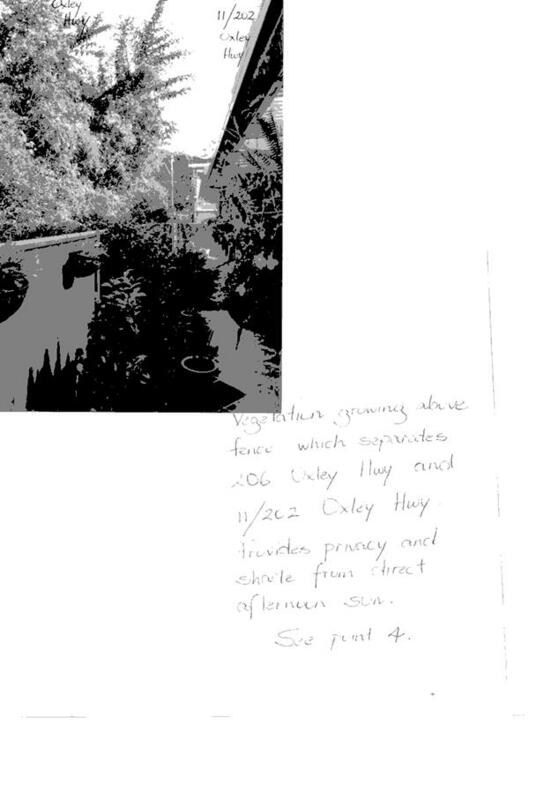 · The shadows cast by the proposed dwelling do not impact the private open space of the western allotment at any time of day. The eastern facade (containing Bedroom 1 (with no eastern facade window or opening), ensuite and garage (containing no eastern facade window or opening) will receive shadow between 9am to approximately 11am. From 12 noon the proposed dwelling does not shadow any part of the western property. The single storey dwelling on the western allotment casts its own shadow over its eastern facade and private open space area from just prior to 12 noon and throughout the afternoon. The objective of the control is achieved by the articulation of the front facade. The proposal achieves a recessed garage 1.2m behind the built line of the deck above. Street presentation of the dwelling is enhanced by the opposing skillion roof pitches, the recessed upper floor area above the entry porch and use of a combination of external wall cladding and face brickwork. This creates visual interest across the frontage of the property. • The combined width of the proposed garage and carport area is 8.310m or 57.14% of the building width, 7.14% greater than the numerical development provision. 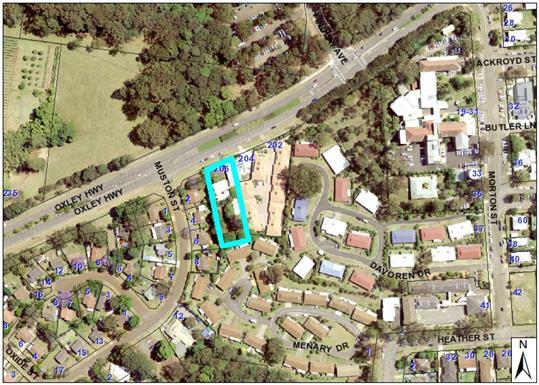 • The carport area has been proposed to provide off-street parking for a registered caravan and tailor. This off-street parking area is proposed to ensure that on-street parking is preserved and the amenity of the area is not adversely impacted by infrequently used vehicles parked on the roadway. 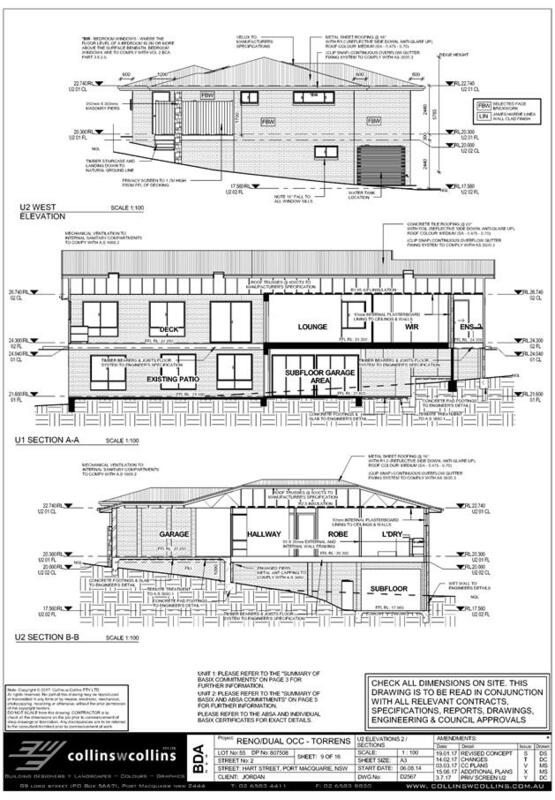 • The proposed carport is to be setback 2.13m behind the front of the dwelling, ensuring that the structure is not dominant within the context of the building as a whole. • The design of the building ensures suitable off-street parking is provided for various vehicles, whilst minimising any impact on the streetscape. · The submission raises a potential non-compliance with access to the private open space as the SoEE submitted references the first floor deck as useable open space. · To clarify this issue, it is noted that the dwelling is setback 6.44m (to edge of rear stairs and first floor deck), 7.54m to the wall of Bedroom 4 and dining area and 10.76m to the wall of the ground floor rumpus room. This equates to approximately 140sqm (at ground floor level) of private open space area for the dwelling. This complies with the minimum area required and is accessible directly from the ground floor rumpus room - a living area of the dwelling. There is ample area to locate a clothes drying area and garbage storage on site. The main area of concern for the submitter is the issue of privacy to their private open space area. This area is oriented to the north-east of the allotment, a similar orientation to the proposed dwelling. This, together with the first floor setback and location of the stairs, remain the outstanding matters that could not be resolved between the applicant and the submitter. These matters are interrelated. The assessment of the plans has established that the western setback of the proposed dwelling is acceptable and there is no adverse impact associated with shadowing of the western property. The windows along the northern section of the facade are high set (being 1543mm above finished floor level) and the orientation of the living area of the proposed dwelling is towards the north-east. The windows along the southern section of the first floor (Bedroom 2, toilet and study) are narrow vertical windows to provide light and ventilation. The submission maintains that a 3m setback to the first floor level would address both the ‘overbearing structure and eyesore’ matter and the visual intrusion. The assessment in point 3 above establishes that the proposed design, layout and siting of the proposed dwelling is reasonable. The western boundary fence is to be a 1.8m high timber fence. This will provide privacy at the ground level. In relation to the rear stairs the boundary fence will screen the open space area of the western property. The only time overlooking would be possible would be going down the stairs on an intermittent basis. The submitter has also stated that they would screen the pool if no change to the location of the stairs was made. There is no established or evident reason for requiring a relocation of the stairs as requested. Screening of the pool, in a manner acceptable to the submitter, that reflects their specific design requirements and solutions, may be the most appropriate solution in this case. Relocation of the rear stairs is not required as part of this application. N/A. The application is for a single detached dwelling only. Issues raised during assessment and public exhibition of the application have been considered, in detail, in the assessment of the application. Where relevant, conditions have been recommended to manage the impacts attributed to these issues. The site is suitable for the proposed development, is not contrary to the wider public interest and the application has been assessed as unlikely to have a significant adverse on the area. It is recommended that the application be approved, subject to the recommended conditions of consent provided in the attachment section of this report. That DA2017 – 284.1 for alterations and additions to dwelling at Lot 6, DP862732, No. 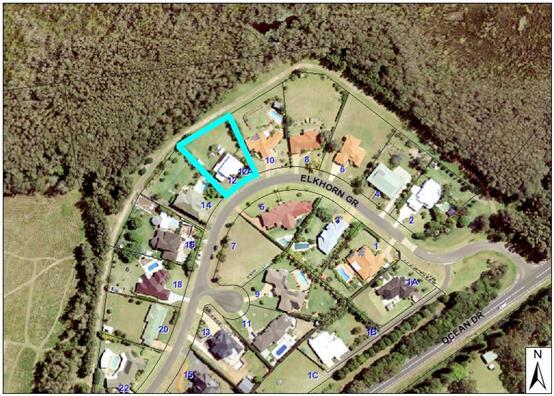 12 Elkhorn Grove, Port Macquarie be determined by granting consent subject to the recommended conditions. This report considers a development application for alterations and additions to the existing dwelling at the subject site and provides an assessment of the application in accordance with the Environmental Planning and Assessment Act 1979. The site has an area of 1775m2. · 7 April 2017 - Application lodged. · 24 April 2017 to 9 May 2017 - Neighbour notification of the proposal. · 18 May 2017 - Additional information requested from Applicant. 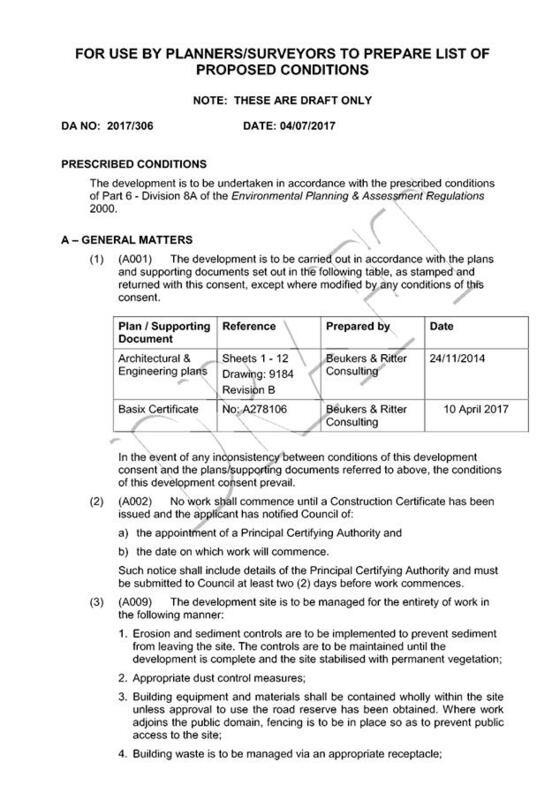 · 31 May 2017 - Additional information and amended plans submitted by Applicant. · Clause 2.2, the subject site is zoned R1 General Residential. In accordance with clause 2.3(1) and the R1 zone landuse table, the proposed development for a dual occupancy (detached) is a permissible landuse with consent. o The development would provide for a variety of housing types and densities to meet the housing needs of the community. 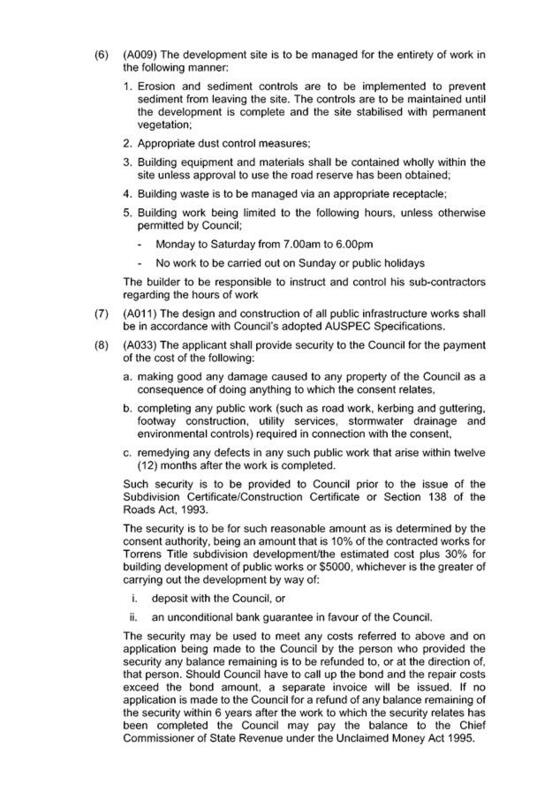 · Clause 4.3, the proposed works will be below the existing ridge height. · Clause 7.13, satisfactory arrangements are in place for provision of essential services including water supply, electricity supply, sewer infrastructure, stormwater drainage and suitable road access to service the development. Provision of electricity will be subject to obtaining satisfactory arrangements certification prior to the issue of a Subdivision Certificate as recommended by a condition of consent. · First floors & above min. 3m setback, unless demonstrated that adjoining property primary living areas & POS unaffected. · Building wall set in and out every 12m by 0.5m. Single storey carport/caravan port. Permitted to extend to side boundary 2 sides open 1/3 perimeter as per BCA. Not considered to be any adverse privacy, overshadowing or bulk and scale impacts. 35m2 min. private open space area including a useable 4x4m min. area which has 5% max. grade and is directly accessible from a ground floor living area. Non- accessible area- for parking of caravan. Deck well away from boundaries. The proposed development will be unlikely to create any concealment/entrapment areas or crime spots that would result in any identifiable loss of safety or reduction of security in the immediate area. The increase in housing density will improve natural surveillance within the locality and openings from each dwelling overlook common and private areas. None proposed to be removed. No Coastal Zone Management Plan applies to the subject site. 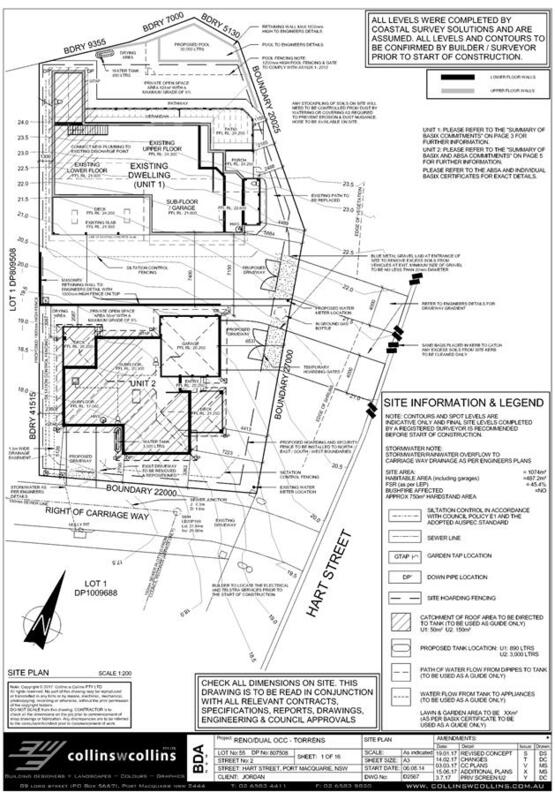 The site has a general southerly street frontage orientation to Elkhorn Grove. Existing dwellings adjoin the site to the south, east, and west. Fire trail, wetlands/ melaleuca forest to the rear. The proposal will be unlikely to have any adverse impacts to existing adjoining properties and satisfactorily addresses the public domain. There are no significant adverse privacy impacts. Privacy has been adequately addressed through building design. There are no adverse overshadowing impacts. The site has road frontage to Elkhorn Grove which is a public road with an AC sealed pavement, a layback kerb and gutter, under the care and control of Council. The traffic associated with the development is unlikely to have any adverse impacts to the existing road network within the immediate locality. Existing vehicle access to the site is though a driveway with direct frontage to Elkhorn Grove. Council records indicate that the development site has existing service from the 100mm diameter water mains. Refer to relevant conditions of consent. Detailed plans will be required to be submitted for assessment with the Section 68 application. The site naturally grades towards the rear. The legal point of discharge for the proposed development is defined as existing. A detailed site stormwater management plan will be required to be submitted for assessment with the Section 68 application and prior to the issue of a Construction Certificate. Evidence of satisfactory arrangements with the relevant utility authorities for provision to each proposed lot will be required prior to Subdivision Certificate approval. No known items of Aboriginal or European heritage significance exist on the property. No adverse impacts anticipated. The proposal includes measures to address energy efficiency and will be required to comply with the requirements of BASIX. No adverse impacts anticipated. No adverse impacts anticipated. Condition recommended restricting construction to standard construction hours. 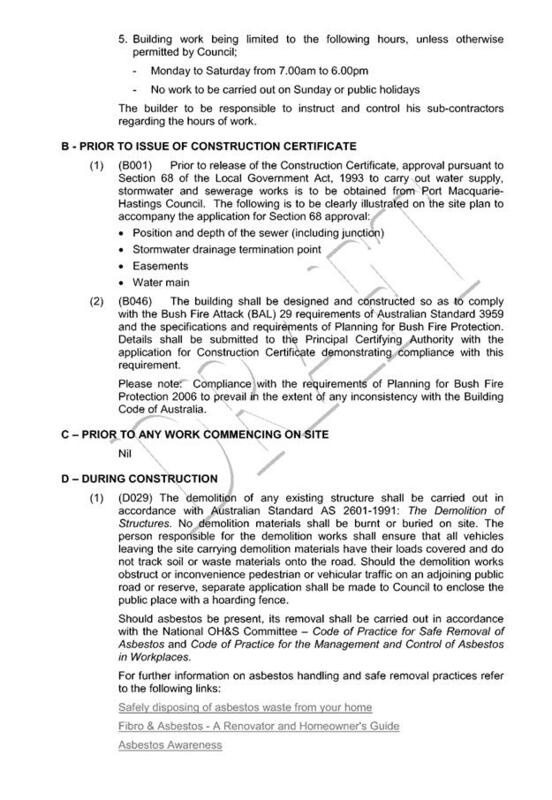 The site is identified as being bushfire prone and will be required to comply with BAL 29 construction requirements. Site constraints have been adequately addressed and appropriate conditions of consent recommended. 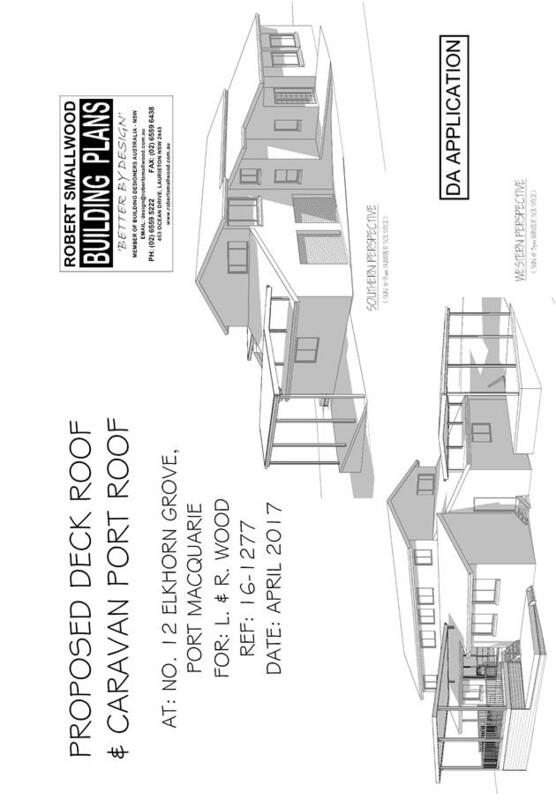 Concerns over roof over existing deck is large and prominent and will result in loss of privacy between the 2 dwellings but conceded not to object. Noted. Deck has significant setbacks from adjoining boundaries and there is not considered to be an adverse privacy impact. Caravan Port unnecessary and impact privacy, loss of sunlight and compromised pool safety fencing. 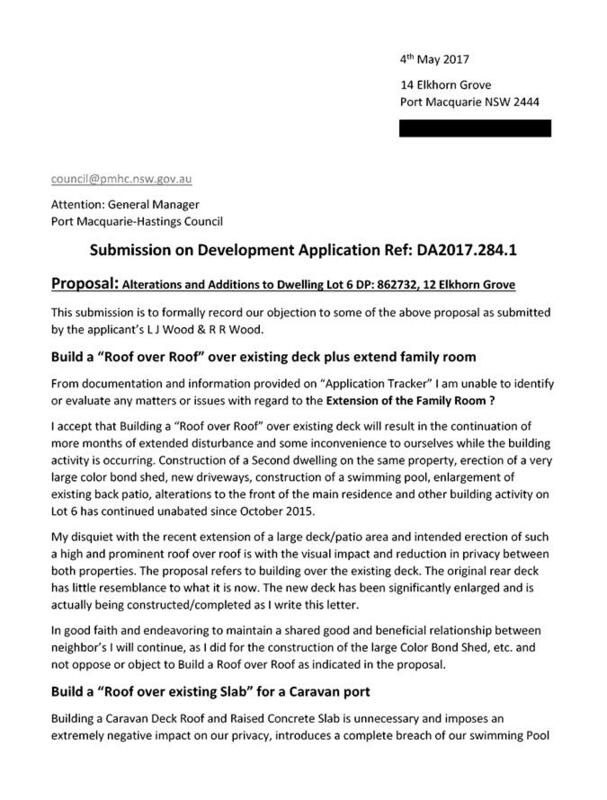 Carport is single storey and permissible at proposed setback. Applicant has offered to construct a privacy screen that is also swimming pool compliant. It is considered that given the orientation and existing vegetation that minimal additional loss of sunlight will occur to the pool area. Unauthorised concrete hard stand area. Complaint has been investigated- appears will fall outside of exempt. Recommend condition of approval that a building certificate be obtained. 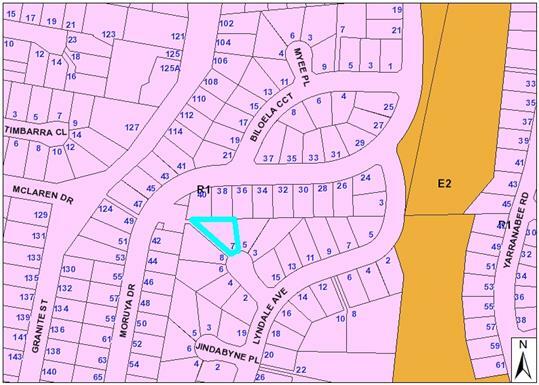 That DA 2017 – 290.1 for a two lot subdivision at Lot 85, DP 204600, No. 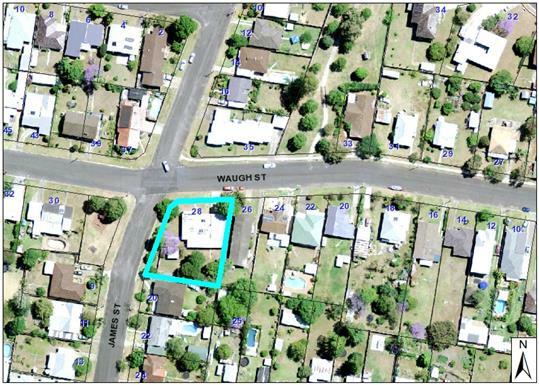 28 Waugh Street, Wauchope, be determined by granting consent subject to the recommended conditions]. This report considers a development application for a subdivision of one lot into two lots and provides an assessment of the application in accordance with the Environmental Planning and Assessment Act 1979. The site has an area of 1258m2. · Site is a corner lot. 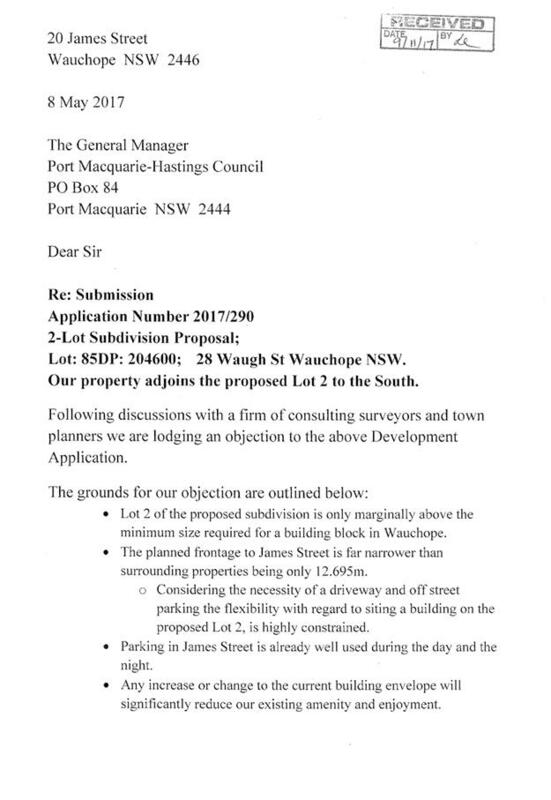 · Access to each lot is from Waugh Street and James Street respectively. The subject land has longstanding history of residential use and is not identified as being potentially contaminated and is suitable for the intended use. · Clause 2.2, the subject site is zoned R1 General Residential. 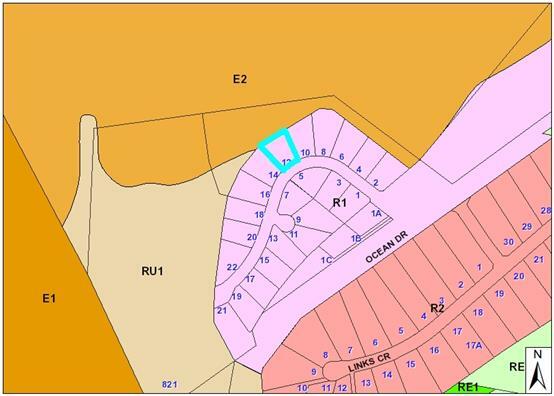 In accordance with clause 2.3(1) and the R1 zone landuse table, the proposed development for the subdivision of one lot into two lots is a permissible landuse with consent. 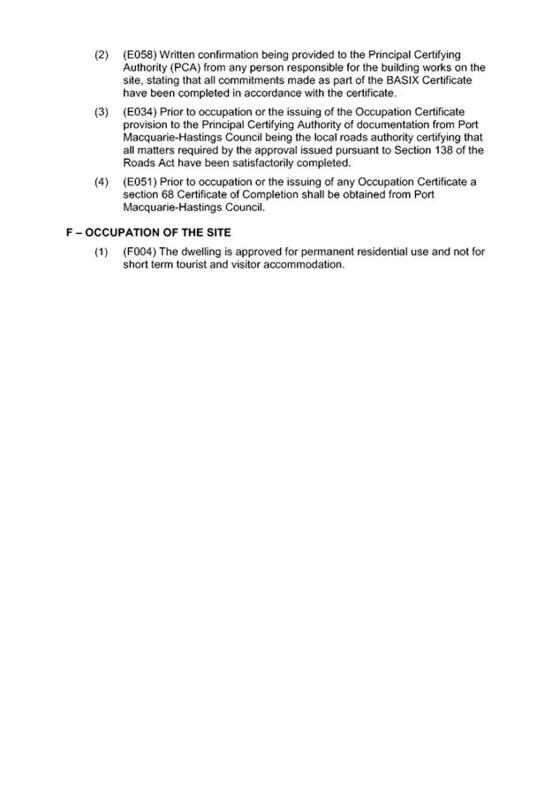 o the site is size and shape of the existing lot is sufficient to allow the creation of a new lot that generally complies with the provisions of HLEP 2011 and DCP 2013.
o The new lot will allow for the development of new general residential development, providing new accommodation within the urban area of Wauchope. 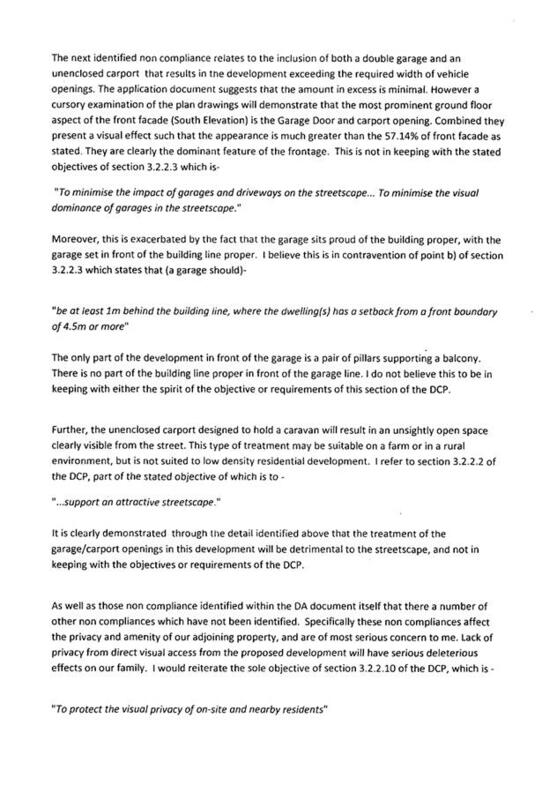 · Clause 2.7 - The demolition of the existing carport may be carried out as exempt development, subject to compliance with the AS 2601—2001. 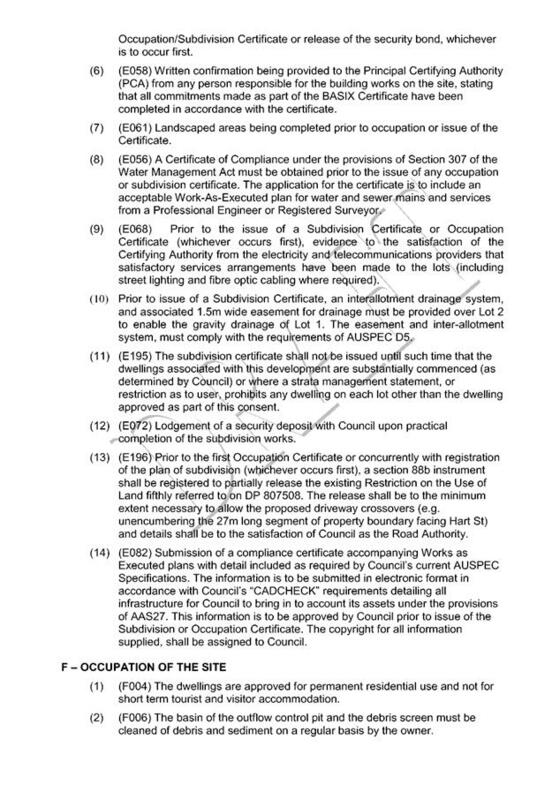 · Clause7.13 - subject to recommended conditions of consent, satisfactory arrangements can be put in place for provision of essential services including water supply, electricity supply, on-site sewage management/sewer infrastructure, stormwater drainage and suitable road access to service the development. Provision of electricity will be subject to obtaining satisfactory arrangements certification prior to the issue of a Subdivision Certificate as recommended by a condition of consent. Torrens title lots minimum width of 15m when measured at a distance of 5.5m from front property boundary. This is a variation of approximately 2m. This variation is considered acceptable as the proposal is an infill development within an existing urban area. A compliant lot width in this case would not result in any different development potential behind the building line on proposed Lot 2. No. Acceptable in this case. Minimum width of 7m when boundaries are extended to kerb line. For lots where average slope of the site is equal to, or exceeds 16%, indicative road and driveway grades are required demonstrating satisfactory access. Satisfactory access is available to both lots. In terms of access the subject site is relatively flat. Lots are to be designed to allow the construction of a dwelling, which does not involve more than 1m cut, or fill, measured from natural ground level, outside the dwellings external walls. Proposed Lot 1: existing single dwelling. Proposed Lot 2: the size and shape of the lot is capable of accommodating new residential development. Lot size and shape are to reflect orientation to ensure future dwelling construction has optimal opportunity for passive solar design. Proposed Lot 2 is of sufficient size and shape for adequate siting, design and layout of new residential development to provide for solar access to the new development. Access into Proposed Lot 2 will be determined as part of the design and siting of new residential development on the site. 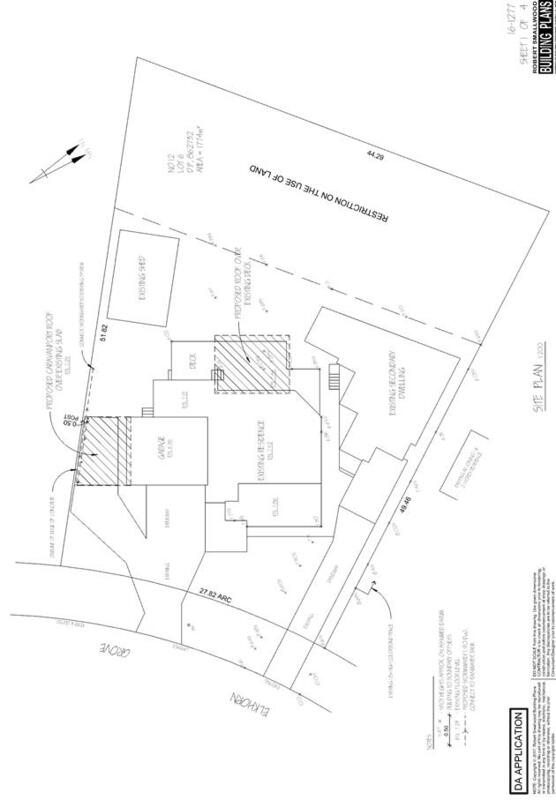 It would be pre-emptive to locate a crossover and driveway to this site as part of the subdivision construction certificate, noting that an existing crossover currently provide access to the carport at the rear of the existing dwelling. Based on the above assessment, the variation proposed to the lot frontage of proposed Lot 2 is considered acceptable and the relevant objectives have been satisfied. The variation does not amount to an adverse impact or a significance that would justify refusal of the application. 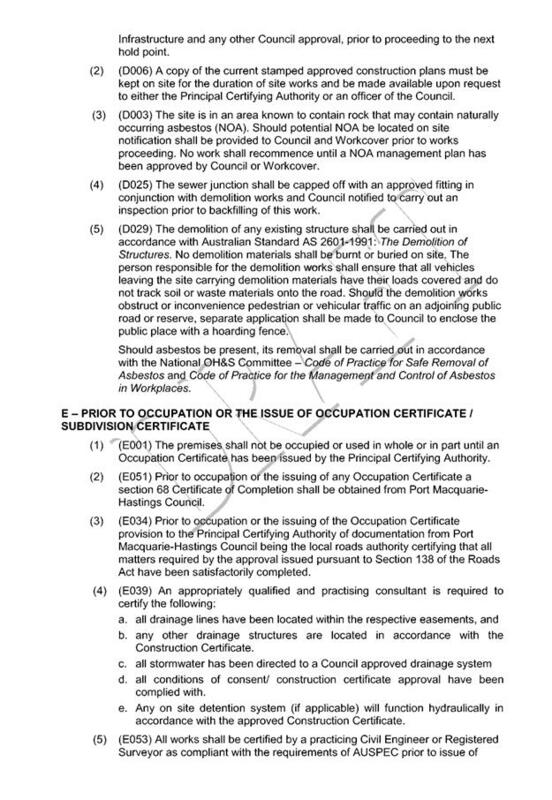 Demolition of the existing carport on the site is capable of compliance with this Australian Standard and is recommended to be conditioned. The site to be subdivided is a corner lot, over 1200m2 in area. 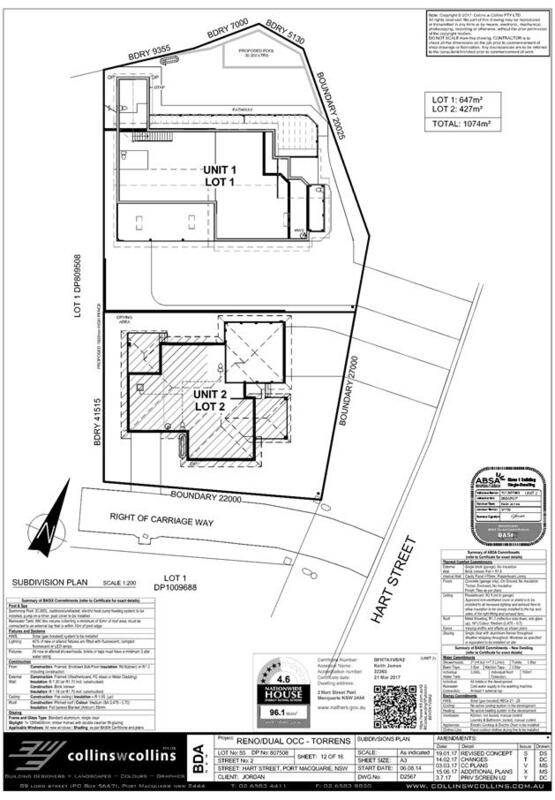 The existing dwelling is oriented to Waugh Street and the new lot is oriented to James Street. The area is characterised by low density residential development, predominantly single detached dwellings. A small ‘pocket park’ playground is located opposite proposed Lot 2. The site has road frontage to Waugh Street and James Street. James Street is mapped as a Council-owned road while Waugh Street, like many roads in Wauchope, is currently mapped as a crown-owned road. 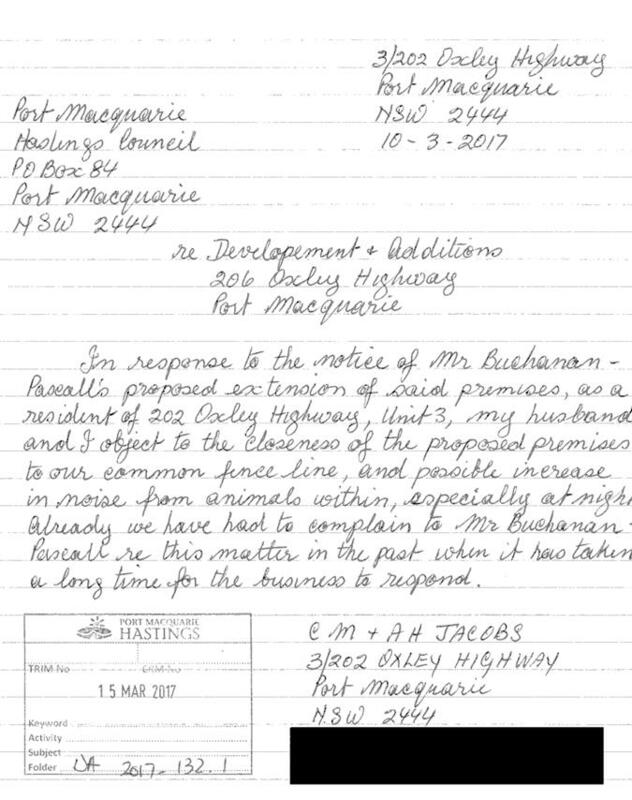 This historical issue is likely to be resolved by the Crown Lands authority in future and has no impact on this application for subdivision. Both roads are currently maintained by Council, have 20m wide road reserves and approximately 13m wide sealed carriageways. 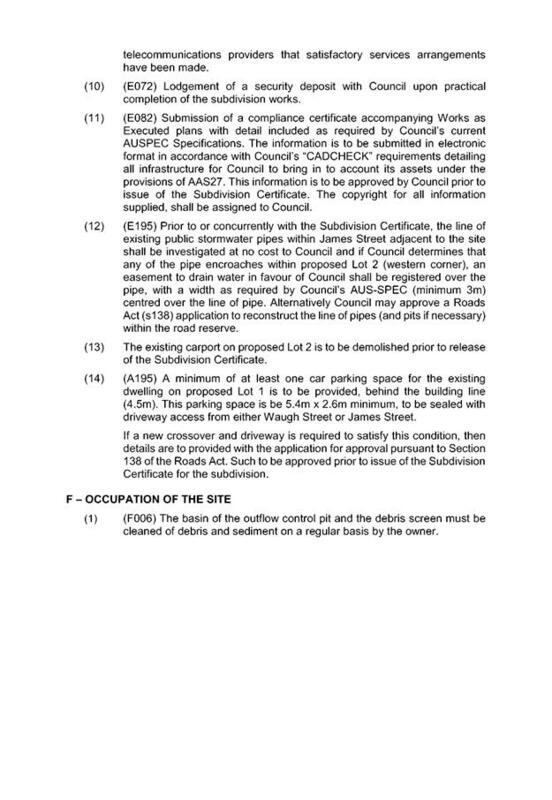 Waugh Street is classified by Council as an Urban Collector road (under the AUS-SPEC system) while James Street is an Urban Local Street. Both roads are also bounded by upright (SA) type kerb and gutter. There is no concrete footpath within James Street near the development site, while Waugh Street does have concrete footpath on the opposite (northern) side of the road from the site. A single residential dwelling is expected on average to generate 7-9 trips per day based on data collected in the RMS Guide to Traffic Generating Developments and Council’s own local experience. The proposal is to subdivide and create another residential allotment which if developed using Complying Development provisions represents an intensification of another 7-9 trips per day. The existing local road network has sufficient capacity to cater for the proposed traffic increase. The existing dwelling (proposed Lot 1) currently has vehicular access via a driveway crossing and layback in the north eastern corner of the site. The proposed Lot 2 is of sufficient size to enable a variety of future residential proposals and so the location of a driveway crossing should be determined with the future proposal. It is noted that there is an existing layback formed within the kerb serving Lot 2 (apparently poured with the original kerb and gutter construction). The existing dwelling has no formal garage parking space, and has two parking spaces within the driveway forward of the building line. No additional on-site parking is required for Lot 2 at this time as this is to be designed with any future proposal (Complying Development or DA). 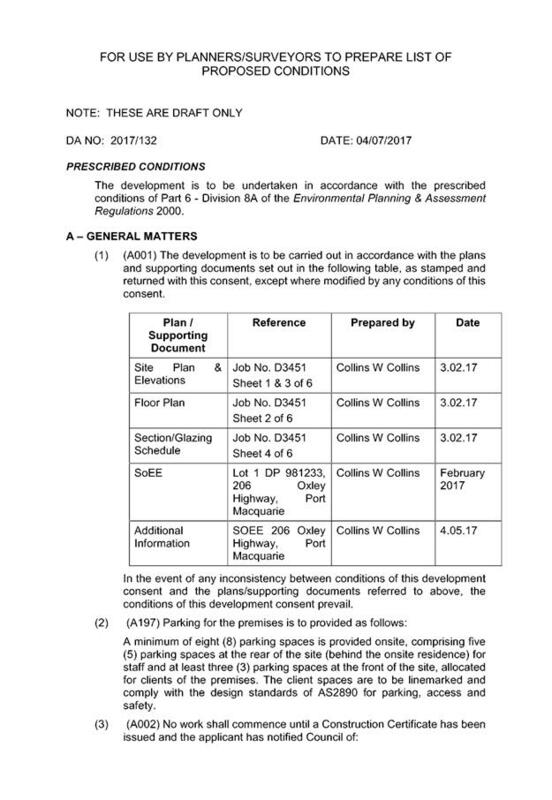 Because proposed Lot 2 meets the minimum lot size for the zone it can reasonably be expected to accommodate the minimum parking demand and on-site manoeuvring required by Council’s Development Control Plan with any future application. Council records indicate that the development site has an existing 20mm metered water service from the 100 AC water main on the opposite side of Waugh Street. This water service can remain in use for Lot 1. A second sealed water service is required for proposed Lot 2. Details are to be shown on the engineering plans. Relevant conditions of consent to apply. 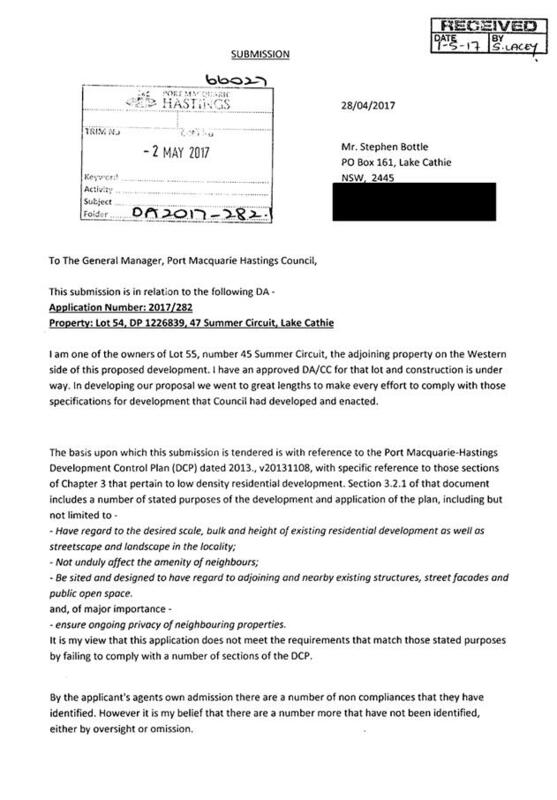 Council records indicate that the development site has multiple connections to sewer. 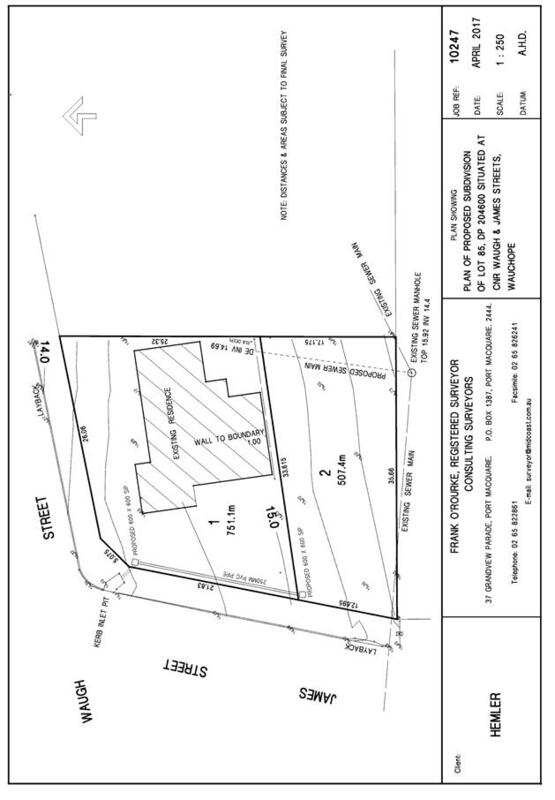 Each proposed lot must have an individual connection to sewer. Any unused sewer junctions must be capped. Details are to be shown on the engineering plans with the CC documentation. A separate sewer connection to Councils main is required for each Torrens Title lot. A manhole will also be required at the high end of the line as it will be more than 40m long. If the main is subject to future extension an end of line terminal shaft (poo pit) will be required. The site naturally grades towards the Waugh Street (northern) frontage. 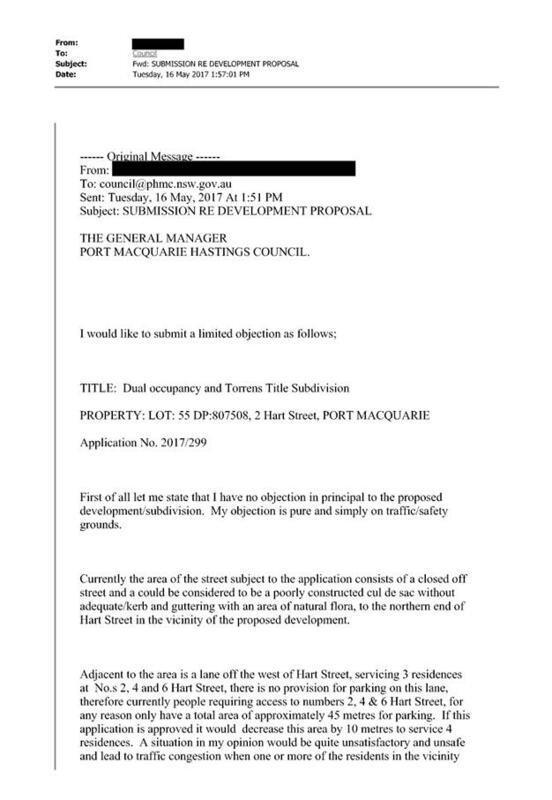 The legal point of discharge for the proposed development is defined as a direct piped connection to Council’s stormwater pit/pipeline within James Street. Stormwater from the proposed development is planned to be disposed of constructing a new inter-allotment drainage line burdening Lot 1 and benefitting upstream Lot 2. A detailed site stormwater management plan will be required to be submitted for assessment with the S.68 application and prior to the issue of a Construction Certificate. 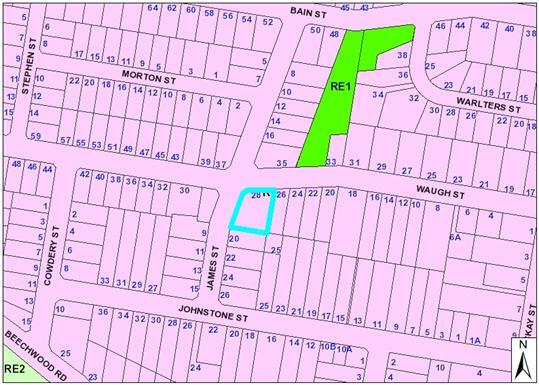 Council’s mapping system indicates there is a possibility that the existing street drainage pipe (recorded as 750mm in diameter) on the eastern side of James Street encroaches within the corner of proposed Lot 2. This is shown as a straight line of pipe between the pit at the intersection and the lot. 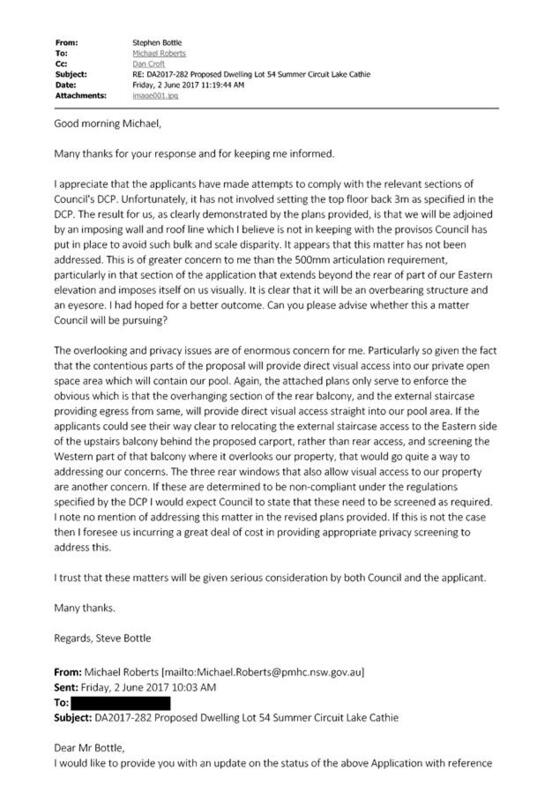 If investigation by the applicant proves this to be correct, the issue needs to be rectified prior to any intensification proposal being finalised. This can be achieved by providing an easement to drain water in favour of Council (minimum 3m wide centred over the existing pipe) as part of the Subdivision Certificate. 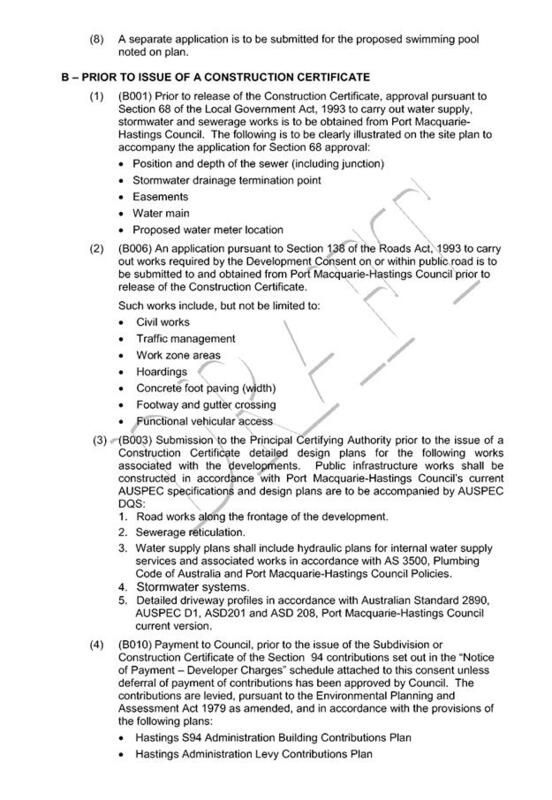 Alternatively the stormwater pipe may be relocated into the road reserve if a satisfactory design can be achieved. If any work (e.g. on sewer or stormwater drainage lines) is required within adjoining properties, the written consent of that owner to the work will need to be obtained before a construction approval can be issued. Relevant conditions of consent to apply. Telecommunication and electricity services are available to the site. Evidence of satisfactory arrangements with the relevant utility authorities for provision to each proposed lot will be required prior to Subdivision Certificate approval. Relevant conditions of consent to apply. The construction of the proposed development will be unlikely to result in any adverse impacts on the existing air quality or result in any pollution. Construction of the proposed development will not require any removal/clearing of any significant vegetation. No requirements. Demolition waste will be generated by the removal of the existing carport. Site works may also generate wastes. A Waste Management Plan is to be submitted with the Construction Certificate documentation. No adverse impacts anticipated. Standard precautionary site management condition recommended. The two lot subdivision is unlikely to result in any adverse social impacts. The size and shape of both resultant lot is acceptable. The proposal is small development resulting in one additional low density residential lot. The proposal is not expected to have any adverse cumulative impacts on the natural or built environment attributes of the locality. The site complies with the minimum lot size requirements of the LEP, achieves the objectives of the R1 zone. The size and shape of the new lot (Lot 2) is adequate for future residential development, subject to approval via DA or CDC. Appropriate conditions regarding servicing of both lots are recommended. 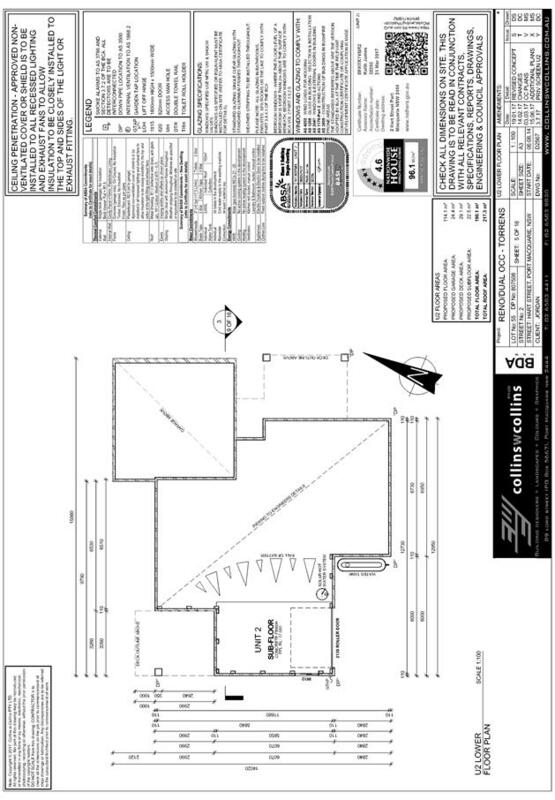 Both lots comply with the minimum lot size of 450m2 under HELP 2011, clause 4.1. Frontage to James Street is narrower than surrounding sites. The frontage to James Street is 12.695m. 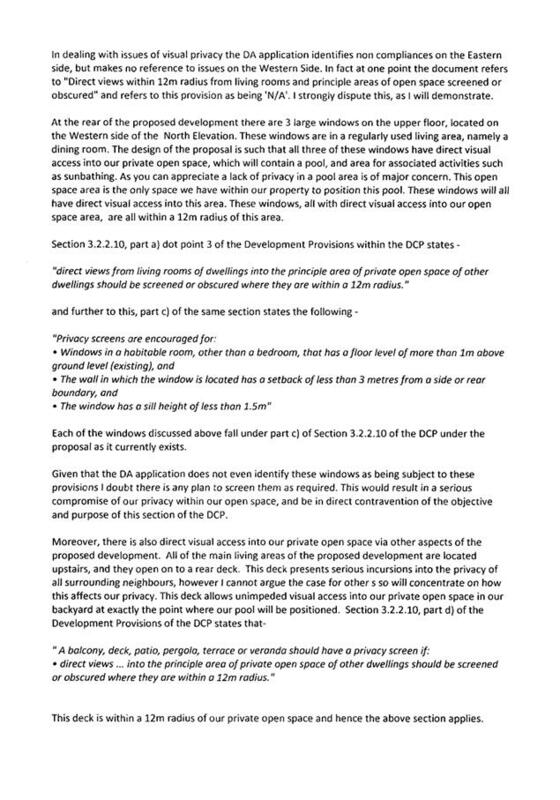 This is a minor variation to the 15m frontage provision in clause 3.6.3.2 (Lot layout) of the DCP 2013. This variation has been addressed and considered reasonable and acceptable in this case. Parking in James Street is already well used day and night. Proposed Lot 2 is sized to contain a residential development compliant with the provisions of LEP 2011 and DCP 2013, including parking onsite. There is an existing crossover on James Street that provides access to the rear of the existing lot. If this is replaced by a new driveway there is no nett loss of on street parking on James Street. Proposed Lot 2 is of sufficient size and shape to accommodate a new residential development on the site. The environmental impact of any new development will be required to address the matters raised. 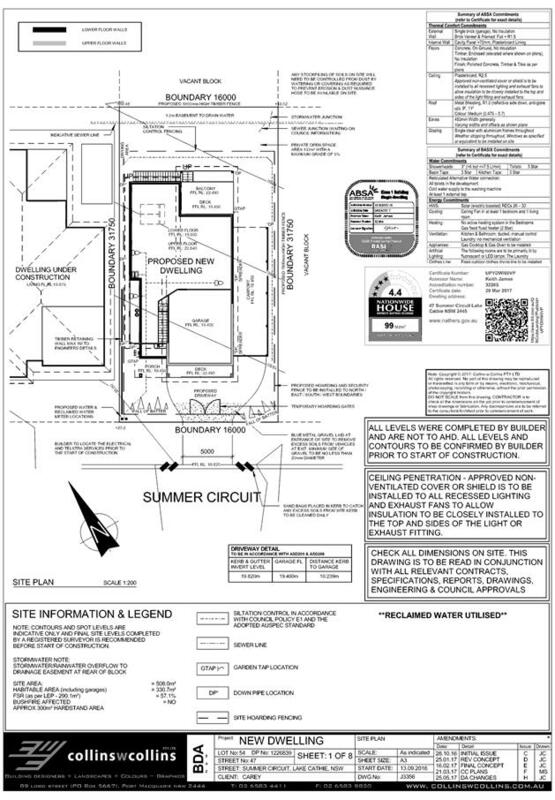 Existing dwelling not shown on plan accurately. The submitted subdivision plan has been prepared by a qualified surveyor. A condition of consent will require a minimum of one car parking space to be provided for proposed Lot 1 that contains the existing dwelling. 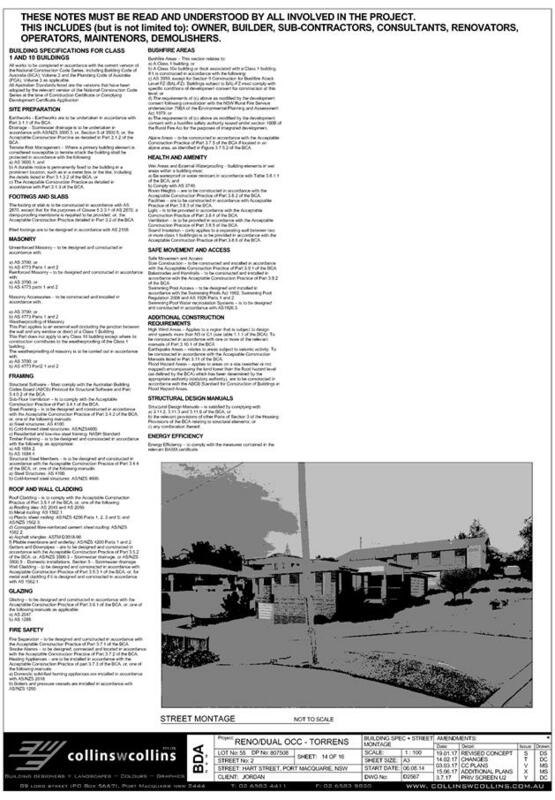 Details to be submitted with the construction certificate for the subdivision works. There is adequate space on proposed Lot 1 to provide this parking. Noted. 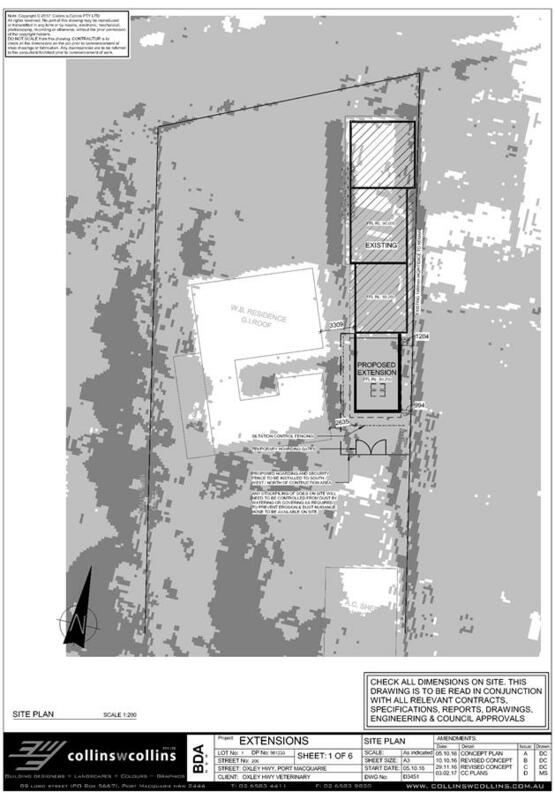 A revised plan was requested and submitted showing the location of the existing carport on the plan. Removal of mature trees from the block in 2016. Unknown. No record of any CRM on record advising of unauthorised or illegal tree removal. Sewer issues with the site. The application was referred to Council’s Engineers. Conditions of consent recommended. Stormwater pooling and ‘wet’ blocks. Any future residential development will be required to comply with the provisions of the EP&A Act. 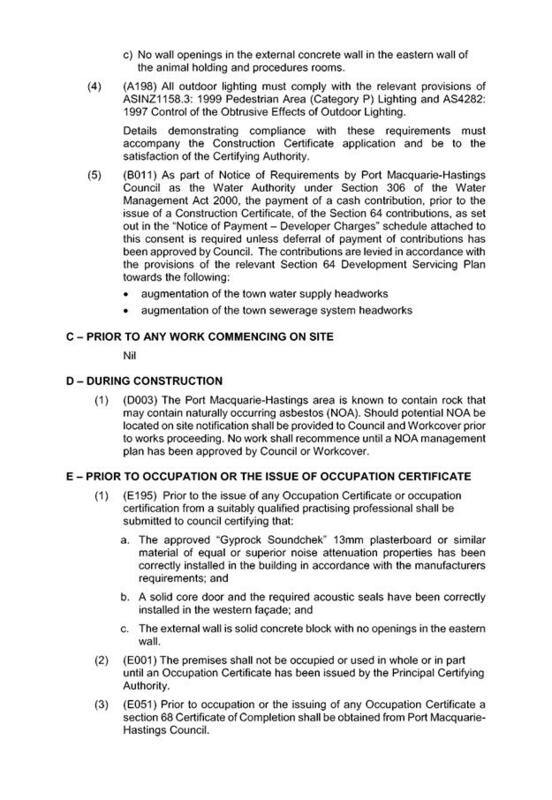 It is acknowledged that that could include a complying development dwelling on the site. Notwithstanding, complying development is subject to approval in accordance with specific provisions of the Act pertaining to siting, design and layout of any proposed development. 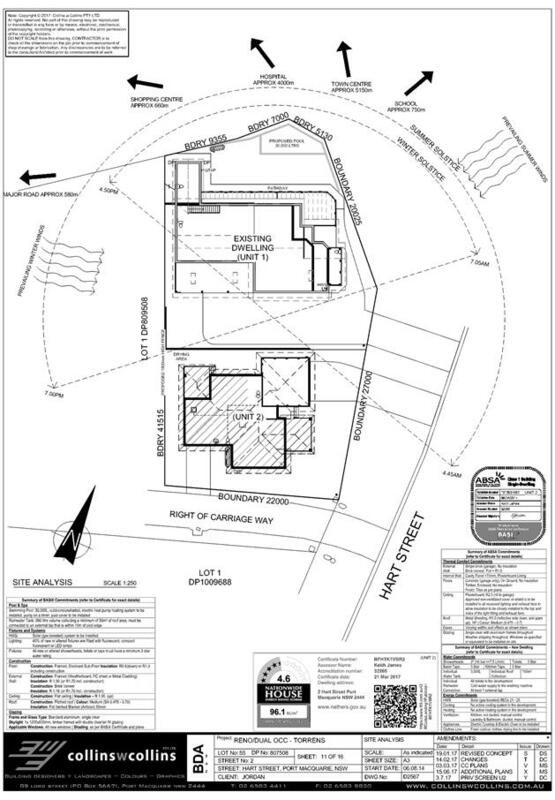 The size and shape of proposed Lot 2 is sufficient to accommodate a dwelling. · Development contributions will be required towards augmentation of town water supply and sewerage system head works under Section 64 of the Local Government Act 1993. · Development contributions will be required under Section 94 of the Environmental Planning and Assessment Act 1979 towards roads, open space, community cultural services, emergency services and administration buildings. That DA 2017 - 299 for a Dual Occupancy and Torrens Title Subdivision at Lot 55, DP 807508, No. 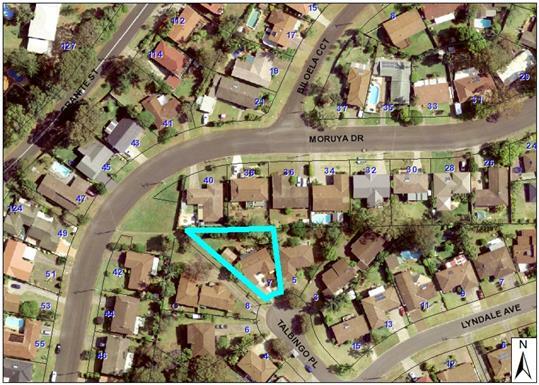 2 Hart Street, Port Macquarie, be determined by granting consent subject to the recommended conditions. This report considers a development application for a dual occupancy and torrens title subdivision at the subject site and provides an assessment of the application in accordance with the Environmental Planning and Assessment Act 1979. Following exhibition of the application, three submissions have been received. The site has an area of 1074m2. · Construction of a single dwelling on the new lot. · 12 April 2017 - Application lodged. · 3 May 2017 to 16 May 2017 - Neighbour notification of the proposal. · 8 June 2017 - Additional information requested from Applicant. 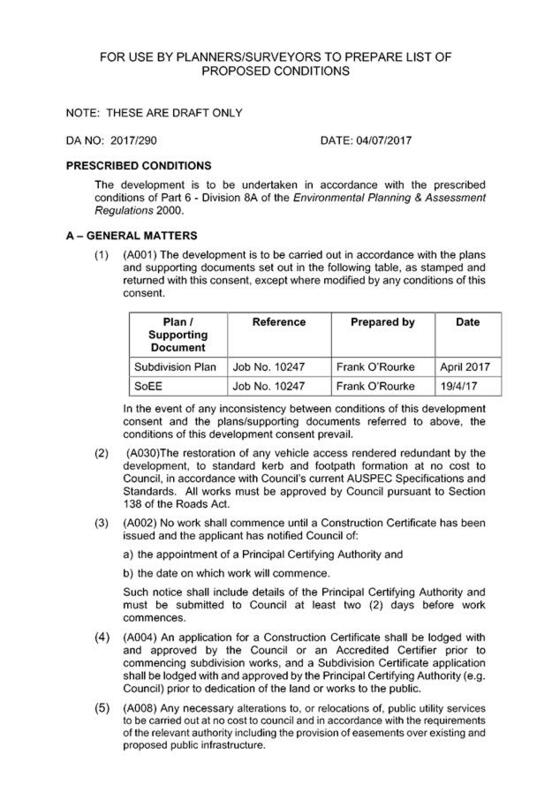 · 23 June 2017 - Additional information and amended plans submitted by Applicant. 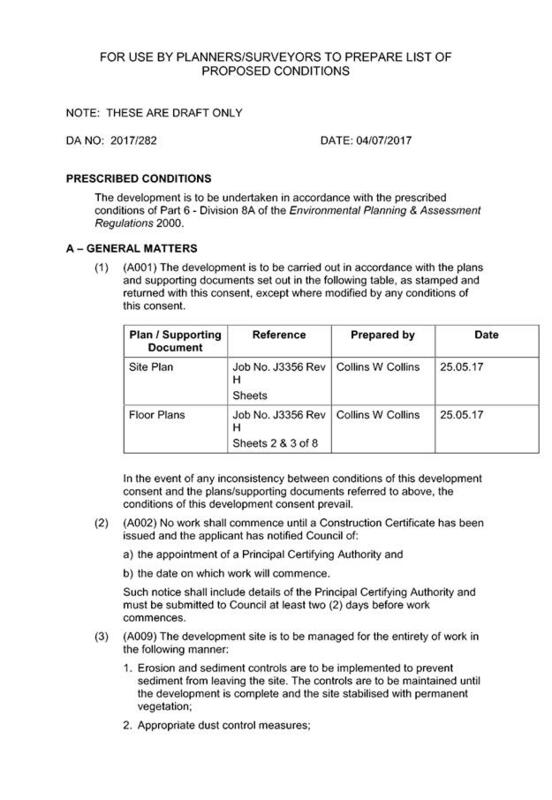 · 26 June 2017 - Copy of amended plans forwarded to objector. BASIX certificates (number 810514S and A277412) have been submitted demonstrating that the proposal will comply with the requirements of the SEPP. It is recommended that a condition be imposed to ensure that the commitments are incorporated into the development and certified at Occupation Certificate stage. · Clause 4.1A – The minimum lot size does not apply as the development includes subdivision into two lots and the construction of a dwelling on each lot. · Clause 4.3, the maximum overall height of the building above ground level (existing) is 6.794m which complies with the standard height limit of 8.5m & 11.5m applying to the site. · Clause 4.4, the floor space ratio of the proposal is 1:1 which complies with the maximum 0.65:1 floor space ratio applying to the site. Minimum 4.489 Unit 1 setback to local road. Minimum 6.537m setback and more than 1 metre behind the building line. 5.0m wide and 33% of building width. 5.0m wide and 25% of site frontage. 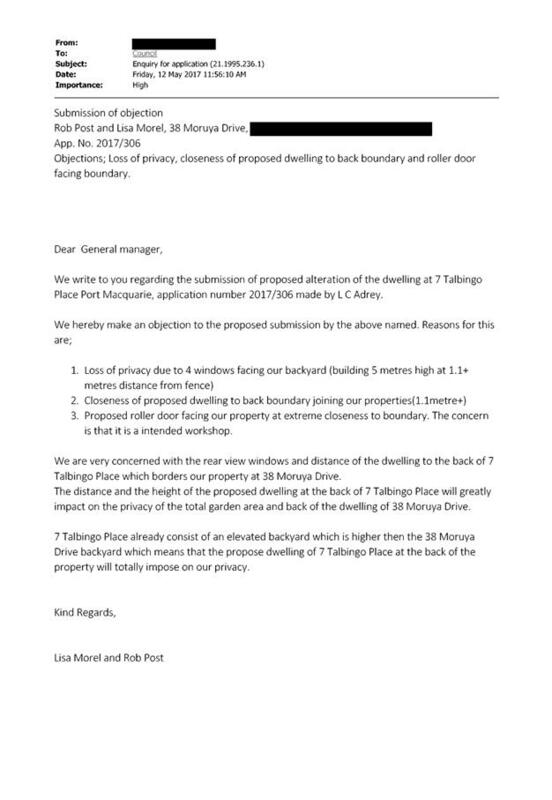 The Applicant has submitted shadow diagrams demonstrating that the development would not adversely overshadow neighbouring primary living areas and private open space for more than 3 hours on 21 June. Unit 1 and 2 have a minimum 35m2 private open space including 4m x4m area accessible from living room. Multiple deck and usable open space areas are provided that enable outdoor living and utility spaces. 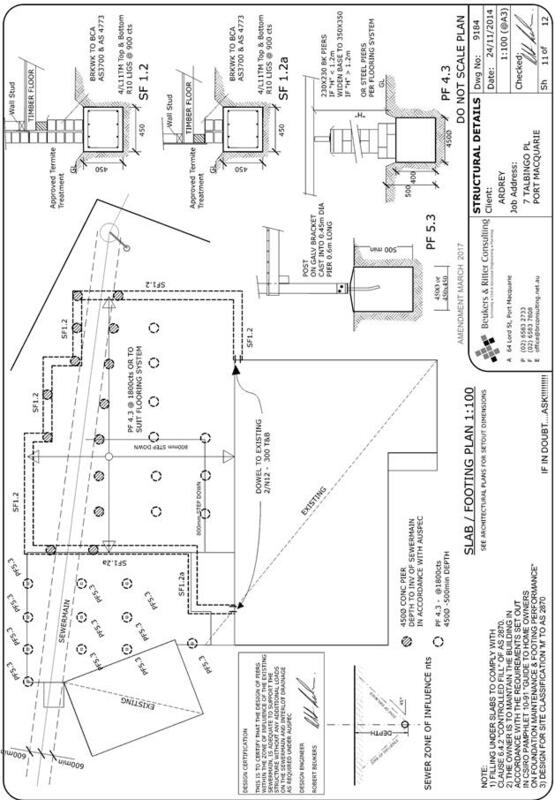 · 0.9x0.9m splays adjoining driveway entrances (Fig 3.3 of AS2890.1 2004 overrides this standard by requiring a min 2.5x2m splay for driveway entrances) See David Troemel for info. Boundary fencing and existing landscaping assist with screening. 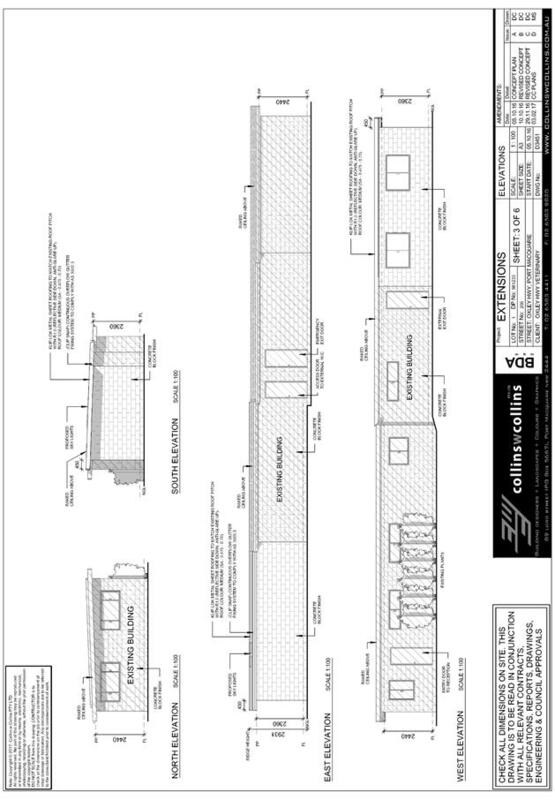 The applicant has also amended plans to provide a privacy screen to unit 2 deck adjoining side boundary. Maximum 1m retaining wall along road frontage. Condition recommended requiring certification of retaining walls. Maximum 1m retaining wall along road frontage with 1.5m fence setback 1m behind the top of the retaining wall. Street tree vegetation proposed to be removed to enable driveway construction. Single shared driveway 5.0m wide proposed to each dwelling. Additional access from ROW. Double garage for each dwelling. Capable of complying. 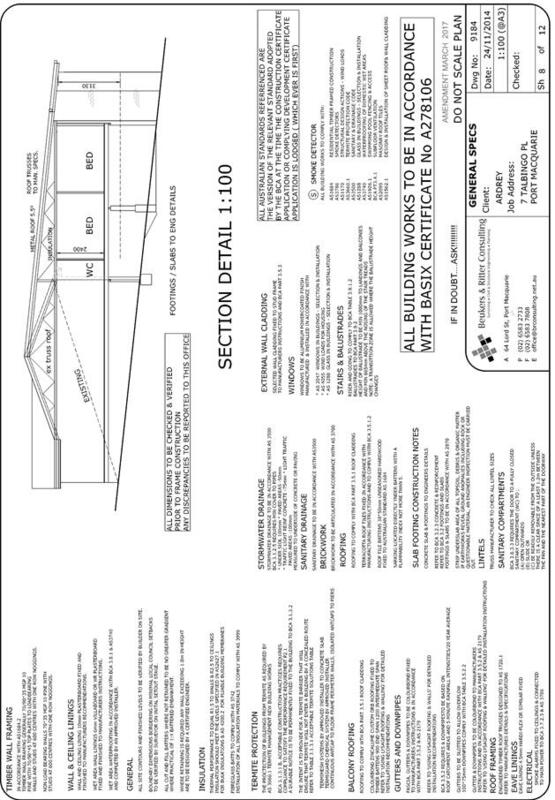 Long section will be required prior to the issue of a Construction Certificate. · Is part of an integrated Torrens title housing development. Proposal is an integrated Torrens title housing development and includes creation of one lot smaller than 450m2. · there is sufficient space for garbage collection on the frontage. Proposal includes construction of dwelling on each lot and has detailed the extent of cut and fill. Water supply to meet Council’s design specifications. See comments later in this report under Water Supply Connection. All lots connected to reclaimed water if available. Separate sewer junction provided for each lot. See comments later in this report under Sewer Connection. Erosion and sediment control plan to be provided. Standard condition recommended confirming this requirement. All service infrastructure should be underground unless otherwise approved by Council. Condition recommended requiring satisfactory arrangements certification from electricity and telecommunications authorities. 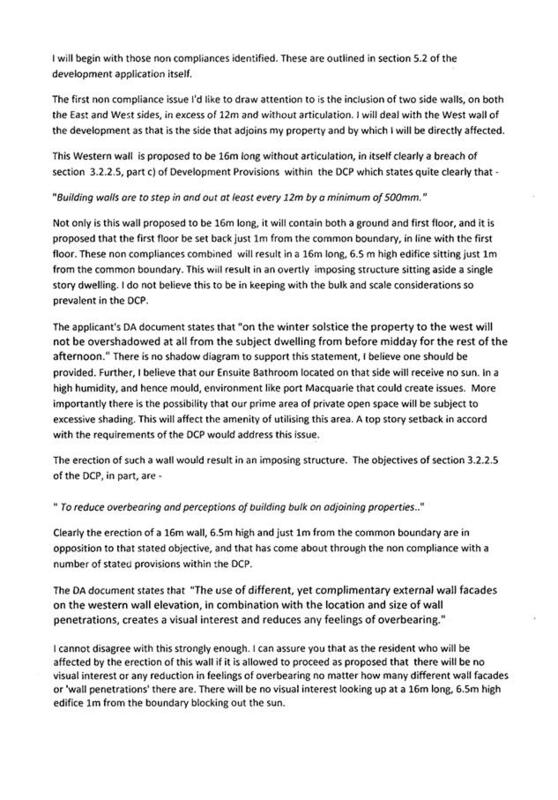 The proposal seeks to vary Development Provision 3.2.2.2 in relation to the minimum front setback of Unit 1. The relevant objective is that front setbacks should support an attractive streetscape. 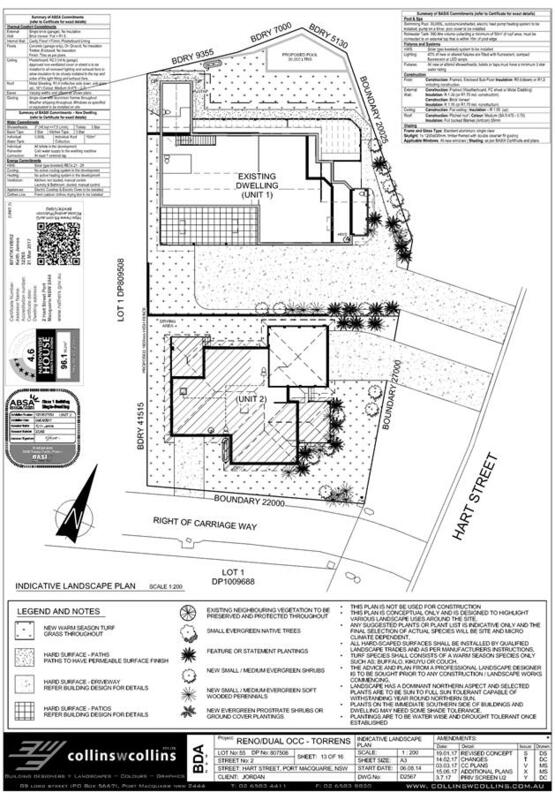 · The site has an angular frontage to the street with a unique generous road reserve that extends to a closed road/cul-de-sac and frontages to the right of carriageway. · The encroachment is minor and relates to the deck. The existing dwelling is currently situated less than 2m from the side boundary due to the current block alignment and this variation is not significantly intensified with the additions to unit 1. Unit 2 has a deck that would generally be permitted within the articulation zone. · The building is articulated and the variation would not adversely impact the streetscape. The proposal seeks to vary Development Provision 3.2.2.4 in relation to the minimum rear setback of Unit 2. · To provide useable yard areas and open space. · The adjoining property to the west is at a higher elevation and the reduced setback would not adversely affect natural light and ventilation between the dwellings. A large high courtyard wall extends around the pool area and retaining walls and what appears to be magnolias are planted along the boundary. 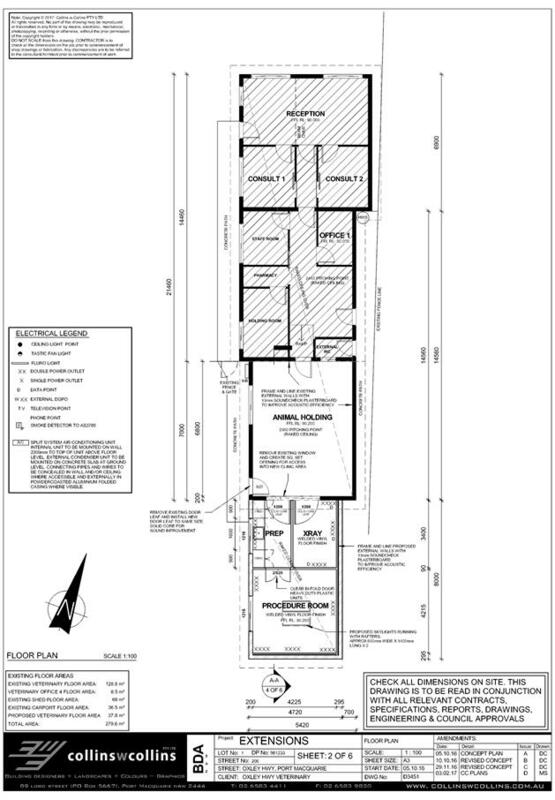 · A useable yard area and decks are proposed between the dwelling and the rear boundary. Based on the above assessment, the variations proposed to the provisions of the DCP are considered acceptable and the relevant objectives have been satisfied. Cumulatively, the variations do not amount to an adverse impact or a significance that would justify refusal of the application. No provisions of the regulations are applicable to the proposal. The site has a general south-westerly street frontage orientation to Beacon Court. Two storey dwellings adjoin the site to the north, east, and west. The proposal will be unlikely to have any adverse impacts to existing adjoining properties and satisfactorily addresses the public domain. There are no adverse overshadowing impacts. 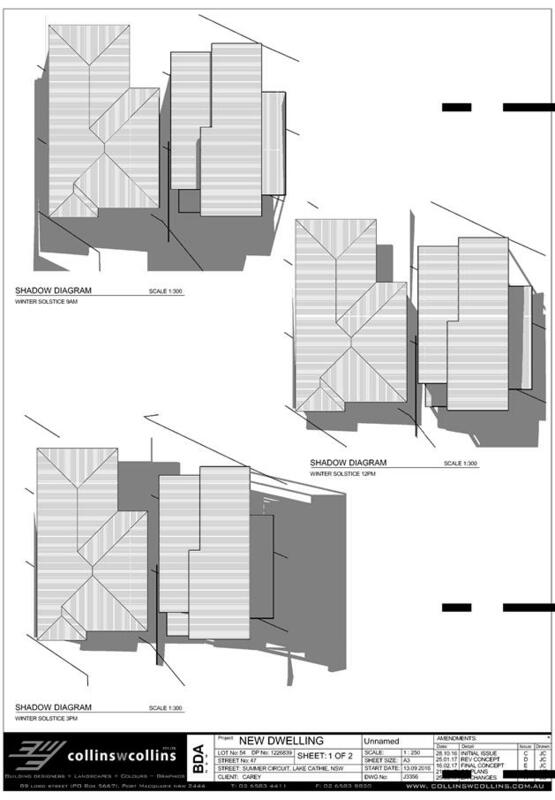 The Applicant has submitted shadow diagrams demonstrating that the proposal does not prevent adjoining properties from receiving 3 hours of sunlight to private open space and primary living areas on 21 June. The site has road frontage to Hart Street to the east and Cathie Road to the north. 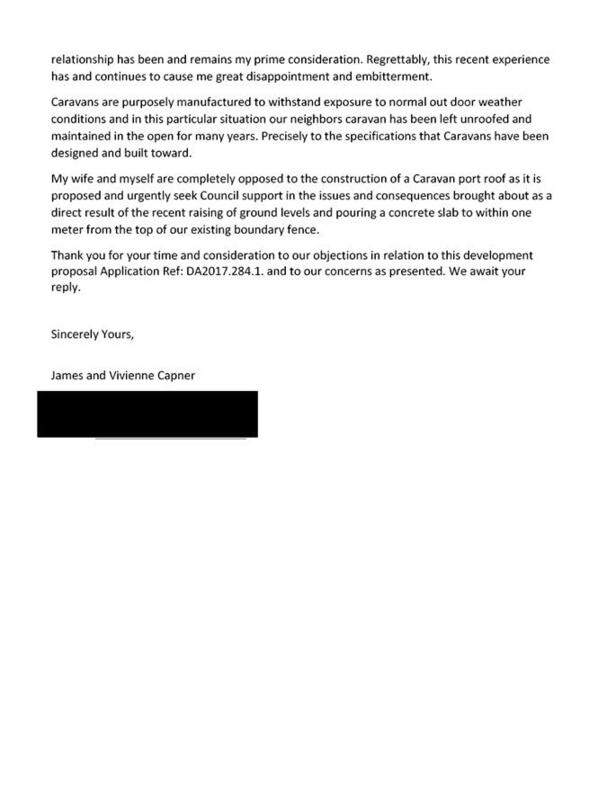 Access to Council-owned Cathie Road is not proposed. The shared driveway along the southern frontage is a privately owned Right of Carriageway and is discussed under the Access heading below. Hart Street is a Council-owned and maintained road with ‘Local Street’ classification under the AUS-SPEC system. It has a sealed carriageway of approximately 8m width, within a road reserve of variable width (minimum 20m wide). From the site southwards, the road is bounded on both sides by rollover (SE) type kerb and gutter, but north of the existing driveway crossover no kerb is formed (grass shoulder). Hart Street has no existing concrete footpaths on either side of the road in the vicinity of the site. No footpaths are required as a result of this development because there is no existing footpath infrastructure in the surrounding streets and considering the low intensity (dual occupancy) nature of the proposal. Having regard to Council’s frontage works policy, a condition is recommended requiring upgrade of the Hart Street frontage of the property with concrete kerb and gutter. This is to ensure that development incrementally deals with the impacts of intensification on surrounding roads by providing required infrastructure. A restriction as to user (fifthly referred to by DP 807508) currently prevents vehicular access across the northern and most of the eastern boundary of the site. Council’s Transport and Stormwater Network staff has agreed that a small part of this restriction can be extinguished to allow the proposed driveway crossovers, noting that Hart Street has been reconfigured as a dead-end with no access to Cathie Road. 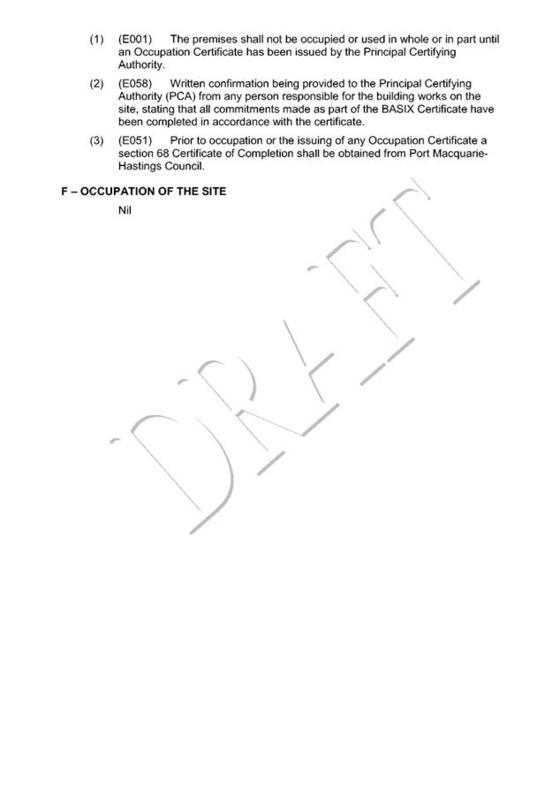 This release will need to occur before the Occupation Certificate is granted, and most likely as part of the Subdivision Certificate application for the proposed subdivision. If Hart St and Cathie Rd are re-connected in the distant future there is considered sufficient space for the intersection design to accommodate traffic safety concerns. The site is currently occupied by a single dwelling which is expected to generate 7-9 daily trips on average with reference to the RMS Guide to Traffic Generating Developments and Council traffic surveys. This development proposes to create an additional dwelling which would be expected to generate an increase of 7-9 daily trips. The existing road network has sufficient capacity to accommodate the increase in traffic trips associated with the development. 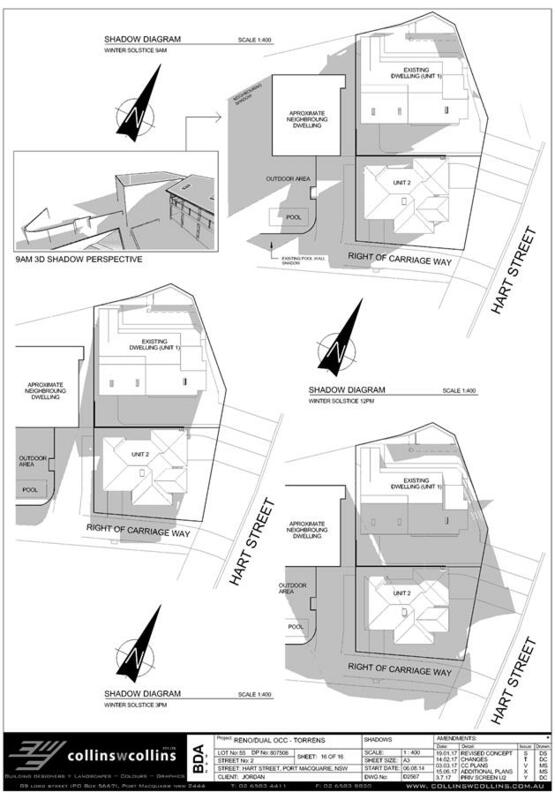 The proposal includes two driveways to Hart Street which have been discussed under the Roads heading above, and a third driveway onto the existing shared access handle to the south, which is a Right of Carriageway benefitting the subject Lot 55. 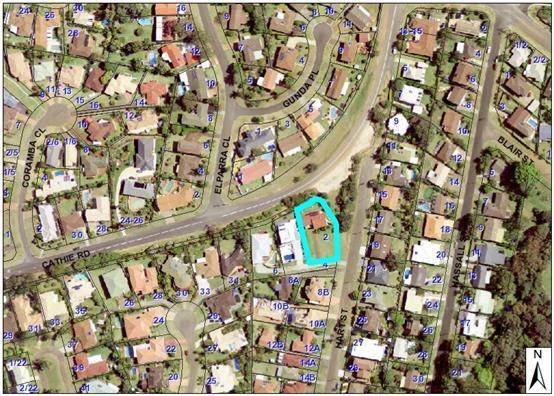 Although legal access was not available to Lot 55 under the original subdivision (DP 807508), dealing 5168052 N was registered in 1998 so that the lot would benefit from this access. Each new driveway crossing on public land will require a Roads Act (s138) application to Council for approval. 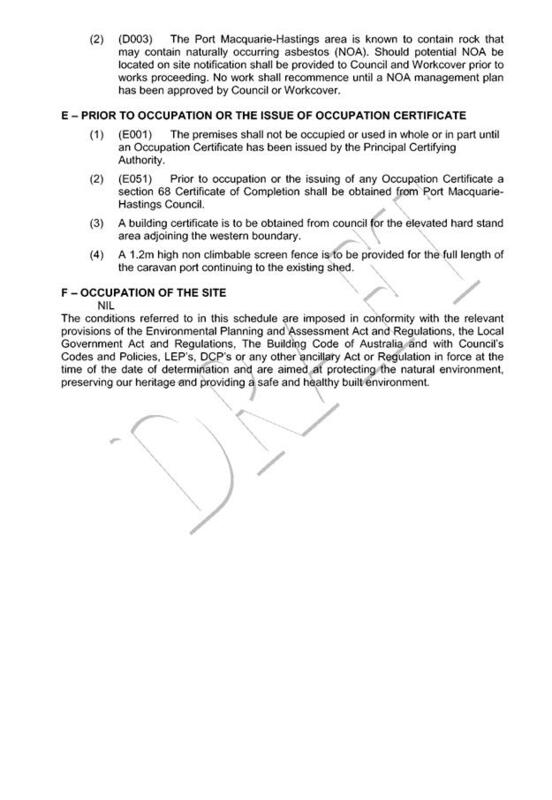 Access shall comply with Council AUSPEC and Australian Standards, and conditions have been imposed to reflect these requirements. A total of 2 existing garage parking spaces are available for Unit 1 (Lot 1). 3 new parking spaces have been provided on-site within garages for Unit 2. Additional informal parking is available in the driveways within each lot boundary. Council’s DCP requires each single dwelling or dual occupancy to provide a minimum of 1 parking space per dwelling. There is approximately 40m (excluding the proposed new driveway crossovers) of additional capacity for overflow parking directly fronting the site within the public 8m wide road, and a condition of consent has been recommended requiring extension of the kerb and gutter along the property frontage to protect and discourage parking on the grass verge. Parking and driveway widths on site can comply with relevant Australian Standards (AS 2890) and conditions have been imposed to reflect these requirements. Refer to relevant conditions of consent. 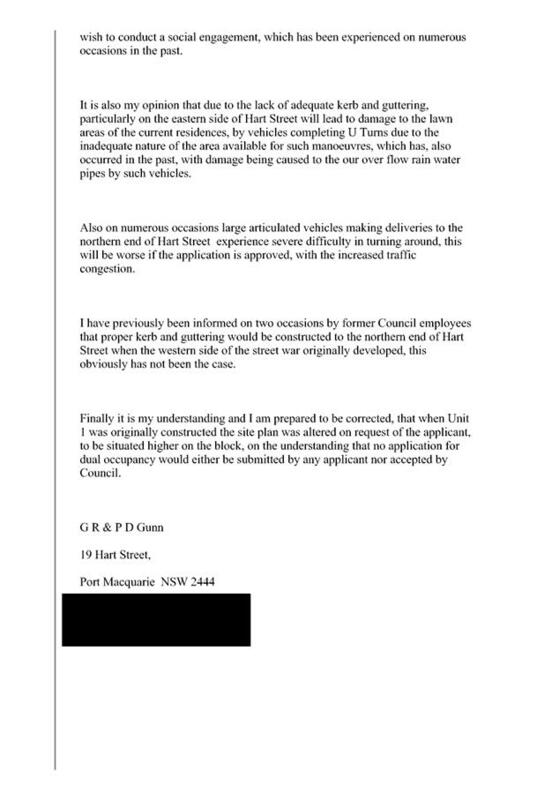 Council records indicate that the development site has an existing 20mm metered water service from the 100 AC water main on the opposite side of Hart Street. This water service can be adopted for Unit 2. A second metered water service is required for Unit 1. The water meter locations shown on the plans are acceptable for Water Supply Section. 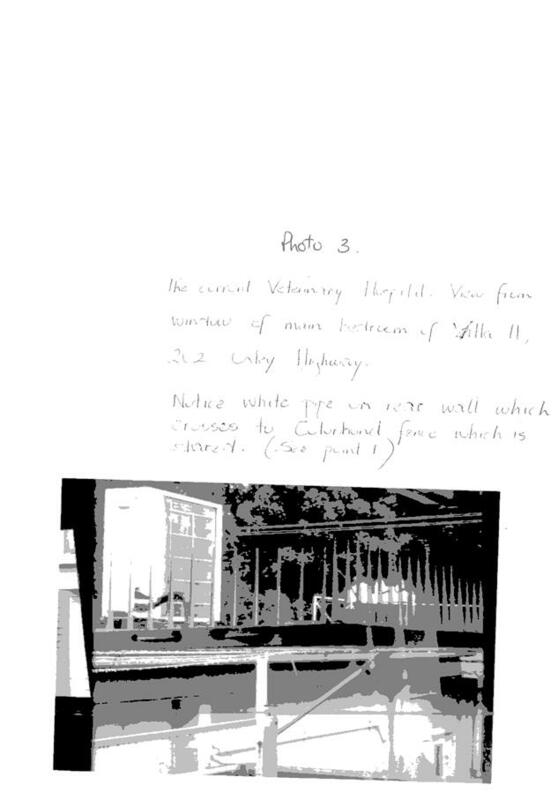 Council records indicate that the development site is connected to Sewer via junction to the existing sewer line that runs outside the southern property boundary. Council’s sewer infrastructure must be extended to provide each proposed lot with an individual connection to sewer. Details are to be provided on the engineering plans. A separate sewer connection to Councils main is required for each Torrens Title lot.A manhole will also be required at the high end of the line as it will be more than 40m long. The hydraulic designer is to confer with Council sewer section prior to submitting sewer design plans. Detailed plans will be required to be submitted for assessment with the S.68 application. The site naturally grades towards the south, to an existing public drainage line and sag pit within the shared Right of Carriageway on the southern boundary of the site. The site is currently benefitted by an easement to drain water (DP 807508) across the handle to the pit. It is likely that a junction into the pit exists for the connection to the existing dwelling although Council’s mapping system has no record of this. 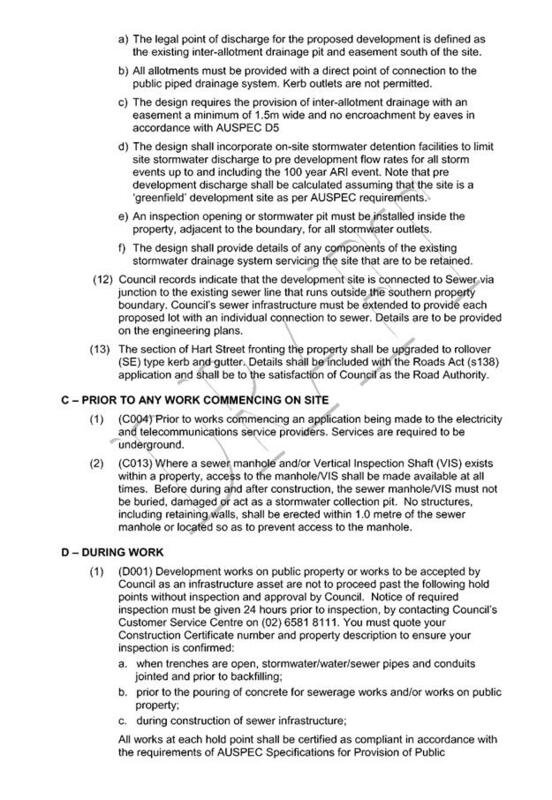 The legal point of discharge for the proposed development is defined as a direct connection to that sag pit which is a part of Council’s stormwater network because it drains Cathie Road from further up the hill to the northwest. 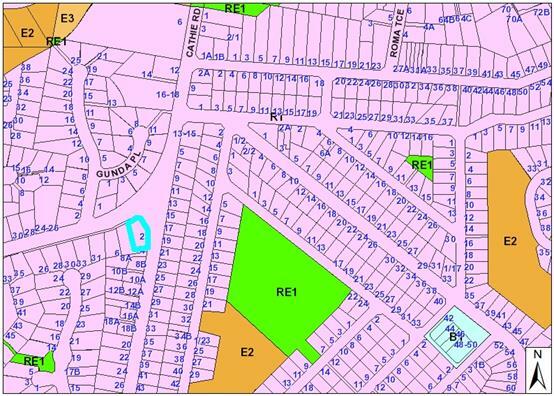 Because the two dwellings are proposed on separate titles (Torrens system), an inter-allotment drainage network and easement is to be extended across Lot 2 to provide a new connection point for Lot 1. The capacity of the downstream junction will need to be proven as part of the detailed hydraulic design, and upgraded if necessary to comply with current standards. 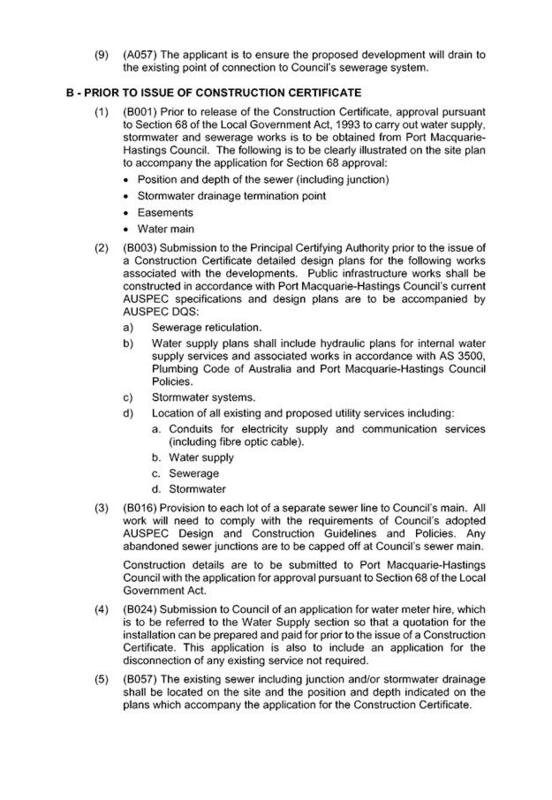 A detailed site stormwater management plan will be required to be submitted for assessment with the S.68 application and prior to the issue of a CC. 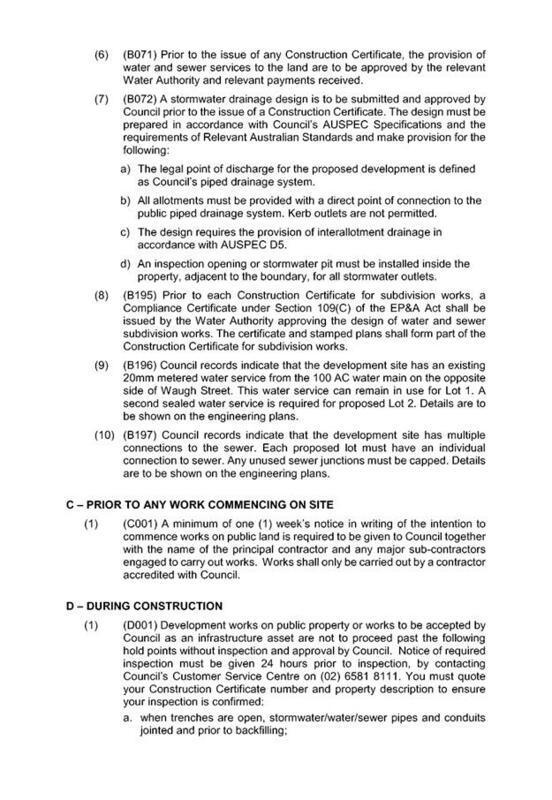 · In accordance with Councils AUSPEC requirements, on site stormwater detention facilities must also be incorporated into the stormwater drainage plan separately for each dwelling. Water tanks may achieve the required detention capacity (hydraulic calculations to be provided). Telecommunication and electricity services are available to the site. It is recommended that the applicant contact the utilities as soon as possible and prior to commencement of construction, to determine any requirements of the relevant utilities to provide separate new services to each dwelling. Evidence of satisfactory arrangements with the relevant utility authorities for provision to each proposed lot will be required prior to Subdivision Certificate approval. Construction of the proposed development will not require any removal/clearing of any significant vegetation and therefore will be unlikely to have any significant adverse impacts on biodiversity or threatened species of flora and fauna. Section 5A of the Act is considered to be satisfied. Some shrubs on the Council verge are proposed to be removed. Three (3) written submissions have been received following public exhibition of the application. Failure of both dwellings to comply with DCP requirements of 4.5m to Hart St. Will detract from amenity and streetscape. Variation considered acceptable given large road reserve and ability for decks/patios to extend to 3m.The existing dwelling has been constructed with side boundary to Hart St with relevant reduced setbacks. Dwelling 2 setback less than 4m from rear boundary. No genuine rear setback given lot configuration, however setback considered appropriate with staggered setbacks and deck areas proposed. No significant privacy, overshadowing or bulk and scale impacts are considered to result from the proposed building setbacks. Adequate separation available between adjoining buildings. Significant courtyard wall on adjoining property at 3m in height provides for added privacy. The proposal is considered to comply with the open space provisions and objectives of the DCP – refer to DCP comments. Council engineering staff have agreed that restriction may be removed. Condition to be applied. Council engineers confirm road capable of accommodation additional traffic that may be generated by the proposal.